Dieterle didn’t want the team’s focus to be on his final season in Severn. As in the previous 10 seasons, he wanted the team’s attention on winning the last game of the season. “Win the last game because if you win your last game, you’re a champion,” Dieterle said. The Cavaliers did just that, winning the IAAM A Conference crown and sending Dieterle, who turned the program into one of the area’s elites, off in style. 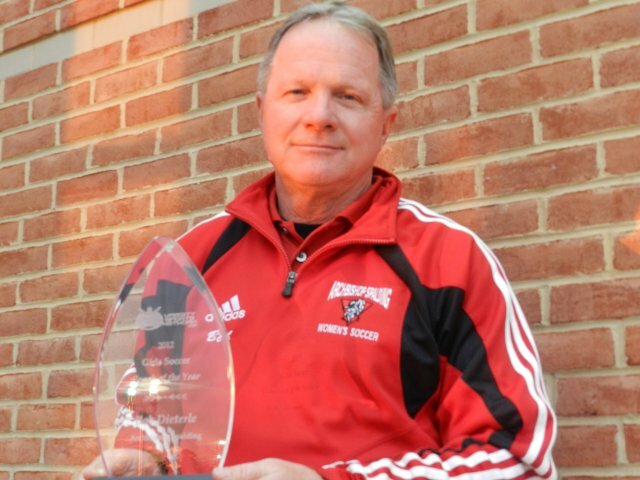 Dieterle is the 2012 Varsity Sports Network’s Girls’ Soccer Coach of the Year. Before the season, Spalding’s administration opted not to renew Dieterle’s contract. Dieterle, who owns an accounting firm, and also coaches club soccer and runs camps, has a house with his wife in Rehoboth Beach, Del. He recently was hired to coach the girls’ program at Cape Henlopen in southern Delaware. “The focus in high school sports is on the participants. We kept it that way and it worked out well,” said Dieterle. With another daunting schedule, Spalding went 1-3-1 in a mid-season stretch featuring 1-0 losses to McDonogh School, Bryn Mawr School and John Carroll School and a tie with eventual WCAC champ and District region’s No. 1 Good Counsel. The Cavaliers, who played eight away games in a nine-game stretch, rebounded with a strong 2-1 win at C. Milton Wright, which eventually reached the Class 3A state title game. “That really seem to energize us going forward,” said Dieterle. The Cavaliers (15-3-3; No. 2 in final VSN's Top 20) didn’t lose again, capped with a thrilling win over McDonogh in the IAAM A finals at Stevenson University. Trailing in the final two minutes, Spalding got the tying score and eventually outlasted the No. 1 Eagles in penalty kicks, ending the Owings Mills school’s 36-game unbeaten streak in league play. In that run were four decisions over the Cavaliers including victory in the 2011 and 2010 league finals. After spending the 2001 season as an assistant coach, Dieterle transformed an average at best program into a powerhouse, winning the 2006 IAAM A crown with a 19-0-2 record. He went 173-24-1 in 11 seasons with league titles in 2008, 2009 and 2012. In the IAAM A Conference championship game against McDonogh on November 5, the Archbishop Spalding girls’ soccer team completed its extraordinary season in most thrilling fashion, coming from a goal down late in the second half to force overtime and ultimately topple the Eagles on penalty kicks, 2-2 (4-2 on kicks). Kelly Patterson’s 78th-minute goal brought the Cavaliers level with the two-time defending champion Eagles, and junior goalkeeper Cassidy Babin’s pair of clutch saves in the shootout set up Patterson’s game-winning shot, sending Spalding to it’s fourth IAAM A Conference championship in the past eight years. Follow-through on such an attitude was necessary against the back-to-back champion McDonogh Eagles, touted—not without good reason—by the Baltimore and national media as a dynasty-in-the-current, a girls’ soccer juggernaut moving inexorably towards an uninterrupted streak of titles in the extremely competitive IAAM. While the Cavaliers were certainly no slouches themselves—14-3-3 entering the title game and appearing in their fourth consecutive IAAM A Conference final, last winning in 2009—they hadn’t beaten McDonogh in three seasons, including a 1-0 home loss to the Eagles on September 28. But the Cavaliers’ never-say-die attitude allowed them to bring the title back to their Severn campus. Spalding put itself on course to the title by breaking a scoreless tie early in the second half on Gracyn Bryant’s free-kick strike. The Eagles responded immediately, scoring two quick goals to take a 2-1 advantage with 20 minutes to play. Needing a tying goal, Dieterle moved Vickie Connor up front to give Spalding three attackers at the top, and the Cavaliers began to put tremendous pressure on the Eagles’ back line. The thrilling equalizer came with less than two minutes to play when Laikyn Duffy threw the ball in to Bryant, who found Julia Heck on the sideline. Heck played the ball across the 18 to a charging Patterson, who finished at the back post. The tying goal had a deflating effect on McDonogh and an uplifting one on Spalding, and the Cavaliers dominated both overtime periods, several times nearly winning it with a sudden-death score. Tied after 100 minutes, the game had to be decided on penalties, and the Cavs were prepared, having already set their shooters and shooting order long before the game and with weeks of extra penalty practice under their belts. “You always have some anxiety about it, but we were confident that we would be able to do it, first because Cassidy is the best keeper in the state,” said Dieterle. McDonogh shot first, and Babin stepped up and kick-saved the Eagles’ first attempt to give her side a huge advantage right off the bat. Sarah Martin gave the Cavs a 1-0 edge with Spalding’s first kick, and Connor and Bryant converted the Cavs’ second and third shots around another save by Babin, setting up Patterson’s championship-clinching shot. Babin, a junior, spoke of the championship as so much more satisfying after having fallen to McDonogh in the final the past two seasons. For Dieterle, who was coaching his final game after 11 years as the head coach at Spalding, the win caps a peerless run. He is 172-24-21 in his 11 seasons, with seven finals appearances in the last eight seasons and a conference-best four IAAM titles. Along with assistant Bob Wagner, Dieterle has built the program into a powerhouse. Season complete. Interscholastic Athletic Association of Maryland A champion. School Facts: Private, 1,250 students in grades 9-12. Notes: After finishing behind McDonogh in the IAAM A Conference standings, Spalding ended up winning the conference title over McDonogh in a championship match shootout. East Carolina commit Gracyn Bryant and Kelly Patterson scored goals in regulation as the match ended 2-2. Spalding won the shootout 4-2 as goalkeeper an UMass commit Cassidy Babin came up with two saves. The result sends off 11-year head coach Bob Dieterle with his fourth IAAM A crown and 173rd career win. Fun Fact: Spalding originally opened in 1963 as Holy Trinity, an all-girls school. It moved in 1966 and took on the name Spalding, but remained an all-girls school until 1973. Patterson came up with two of the biggest goals in her career during the Cavaliers' 3-2 win over McDonogh in the IAAM A Conference final on Monday. Staring at a one-goal deficit with time ticking away in the second half, Patterson picked up a pass from Julia Heck on the left post and beat the goalkeeper with 2 minutes, 24 seconds left in regulation. 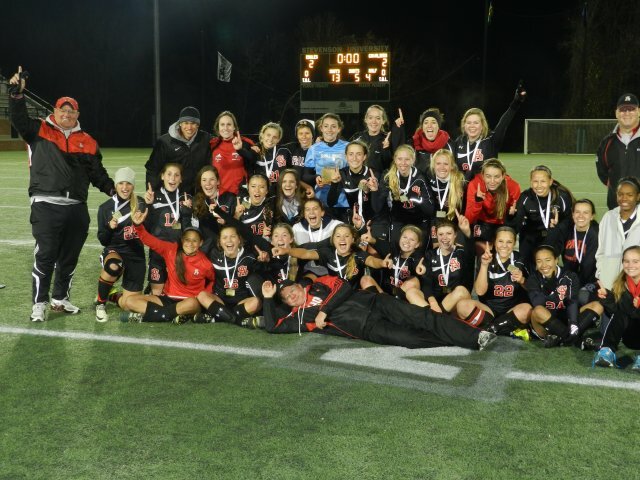 On the fifth round of penalty kicks, with Archbishop Spalding needing only one goal, Patterson delivered to capture the team's fourth title since 2006. Archbishop Spalding High girls’ soccer team gave coach Bob Dietrle the ultimate going away present Monday evening. The No. 4 Cavaliers ended McDonogh School’s championship reign, topping the No. 1 Eagles in penalty kicks at Stevenson University for the IAAM A Conference championship. The fifth-ranked Spalding girls’ soccer team began Monday’s Interscholastic Athletic Association of Maryland A Division tournament final at Stevenson University with two strikers. Trailing McDonogh by a goal with about 15 minutes left in regulation, the Cavaliers added another to the mix, and soon after, Coach Bob Dieterle directed senior Victoria Connor from her fullback spot up to the offensive zone. The desperate move ultimately paid off in Spalding’s first tournament title in three years. Senior Kelly Patterson scored in the 78th minute to tie it at 2, and the Cavaliers beat the Eagles in a shootout, 4-2. 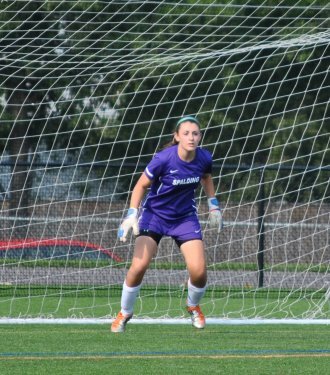 Junior goalkeeper Cassidy Babin stopped two shots and Patterson hammered home the final penalty kick to help the Severn private school snap a four-game losing streak against their rival. Spalding (15-3-3) seized the lead early in the second half on a free kick strike by senior Gracyn Bryant (East Carolina), but McDonogh answered back with two quick goals, forcing Dieterle to get creative. The Cavaliers still appeared headed for their third straight tournament final loss until freshman Julia Heck sent a cross into the box and Patterson got a foot on it, directing a shot just over the goal line for the equalizer. In the two 10-minute overtime periods, Spalding had plenty of chances but had to settle for a shootout to decide the championship. Babin, a Massachusetts commit with 11 shutouts this season, set the tone by stopping McDonogh’s first attempt. The goalie guessed the wrong way, but as she lunged right, she managed to get a foot on the shot and keep it out. She also guessed correctly and caught the third shot of the session. Meanwhile, the Cavaliers were perfect in the shootout with junior Sarah Martin, Connor, Bryant and Patterson connecting on their kicks. 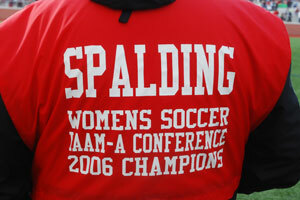 The thrilling championship victory capped the coach’s 11-year career at Spalding. Dieterle built the program into a region power, winning 173 games and four IAAM-A titles. The 2006 All-Met Coach of the Year found out before the season that his contract would not be renewed. Dieterle, 59, said he tried not to make his exit a major theme of the team’s season but the timing of the announcement made it difficult. He recently built a house in Rehoboth Beach, Del., and he said he may move there full-time with his wife, Patti. Last spring, he helped out with the girls’ team at nearby Cape Henlopen High School in Lewes, Del. As she placed the ball down for her penalty kick late Monday evening, several things ran through Kelly Patterson’s mind. The extra practice perfecting her shot the last couple of weeks. The frustration of losing to McDonogh in the past two A title games. In one swift motion of her right leg, Patterson found serenity in her final game. Her penalty kick landed in the top left corner, clinching a 4-2 margin for the Severn school. “I was looking out of the corner of my eye and I just see it hit the back of the net,” said Cavalier goalie Cassidy Babin. The Cavaliers (15-3-3) had a great chance to grab the crown with about four minutes left in the second overtime as Patterson found Maddy Ostrowski in the clear. Ostrowski sent her attempt high over the goal. After 100 minutes of warfare between the rivals, playing in their third straight title match, went to PKs. Enter Babin. The senior goalie easily knocked down a shot by McDonogh freshman Bridgette Andrzejewski, who blasted a shot past the All-Met goalie for the lead in the second half, to start the first PK round. Babin drove to her left to corral Anna Bialczak’s attempt. The Cavaliers were perfect in the defining penalty round with Sarah Martin, Victoria Connor, Gracyn Bryant (scored game’s first goal on a free kick) and Patterson, clinching their first championship since 2009. After going winless in the prior four meetings with McDonogh including the 2011 and 2010 title match, Spalding didn’t wavered after McDonogh responded with goals from Step Holmes and Andrzejewski in regulation. For the first time in three years, McDonogh left a field with a loss in league play. The Eagles, whose streak of 36 straight league triumphs ended, last loss to Mercy in the 2009 league semifinals. The Spalding players ran to other side to acknowledge their supporters, leaving Dieterle to accept the championship bowl and plaque. It was fitting end for Dieterle, who coached his final game with the Cavaliers. “We did this from them. We wanted to them to end on a good note,” said Babin. “As a team, as coaches, all you can ask for is an opportunity to be at the peak of your game when it counts,” said Dieterle, who won his fourth league title. “It doesn’t matter the fifth game, it’s matter the last game. Goals: Spalding – Bryant, Patterson; McDonogh – Holmes, Andrzejewski. Posted: Tuesday, November 6, 2012 2:31 am | Updated: 7:24 am, Tue Nov 6, 2012. 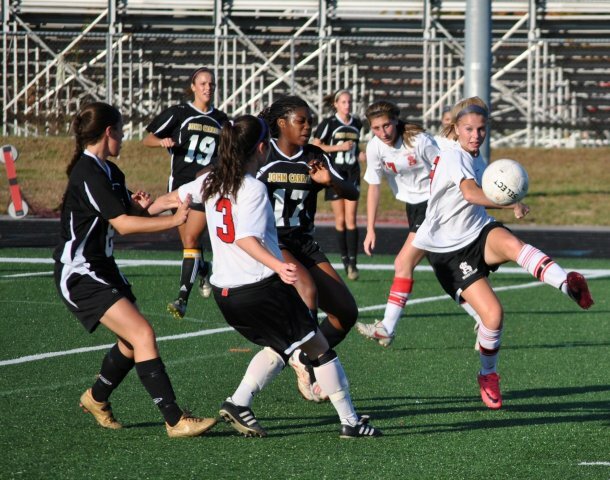 OWINGS MILLS – Kelly Patterson never planned on ending her Archbishop Spalding soccer career with a loss. Especially against McDonogh. This way was much better. Patterson drilled a goal with 2 minutes, 21 seconds left in regulation to force overtime and struck again with the deciding penalty kick on Monday to secure the Cavaliers' 3-2 win and send her coaches out with their fourth Interscholastic Athletic Association of Maryland A Conference title since 2006. After the Eagles (16-3) got goals from Stefani Holmes and Bridgette Andrzejewski during a 19-minute stretch in the second half to answer Gracyn Bryant and take a 2-1 lead, Archbishop Spalding controlled the play at the end of regulation and throughout the second overtime. Finally, with Cassidy Babin in net, the Cavaliers (15-3-3) ended their three-year winless skid against McDonogh by posting a 4-2 performance during four rounds of penalty kicks to reclaim the conference title. Mo Ostrowski, who scored seven of her team-leading 16 goals in the last three games, missed on an open look in the 96th minute. But Sarah Martin, Vicky Conner, Bryant and Patterson were there to pick with penalty kicks. McDonogh, which held its A Conference opponents to four goals – two to Mercy and Mount de Sales – in 12 games, posted a 1-0 win against Archbishop Spalding on Sept. 28. Despite playing without Casey Martinez, who had the overtime winner in the 2010 final as a freshman, the Eagles took a 2-1 lead when Andrzejewski beat Jocelyn Wagner at the top of the 18 and tucked a shot into the right post with 17:18 to go. Bryant, who hit the crossbar late in the first half, gave the Cavaliers the lead at the start of the second by curling a free kick from right to left to get by Lindsey Clark. But Holmes took a corner kick from Jordan Pearson for a header – the same play that won the regular-season meeting – 73 seconds later to bring the Eagles back. McDonogh held Archbishop Spalding to seven shots during the first 77 minutes. Patterson needed only one to extend the season. Julia Heck slipped a pass across the goal box for Patterson, who was waiting on the left post and pounded a shot off Clark's hands to make it 2-2 with 2:21 remaining. Since taking a 1-0 loss on Sept. 25, 2009, the Eagles were 5-0-1 against the Cavaliers and beat them to grab the last two titles. Babin made three saves in the first overtime, including one on Andrzejewski and Bialczak in the final 61 seconds, to force a second session. Ostrowski almost ended the suspense with 4:10 to play when Martin stole the ball from Olivia Jenner and sent a pass to the center. Ostrowski met the ball in stride, but lifted it over the crossbar. Planning for penalty kicks prior to the postseason, both teams had their lineups set and stacked with offensive talent. The major difference was in goal. Babin, a two-year starter with 11shutouts this season, had to outplay Clark, a freshman in her first championship game. Babin made a sliding save with her left foot on Andrzejewski to start the penalty kicks. After Babin felt Pearson's shot roll off her fingers, she made another save with her feet to turn away Bialczak. Between Babin's saves, Martin and Connor buried right-side shots past Clark to give the Cavaliers an edge. Bryant followed the same blueprint and brushed Clark's hands with a shot to the right to make it 3-1. Marcela Robinson stuck the next shot off Babin's fingers to close the gap, but it was too late. Patterson, who hadn't missed a penalty kick all season, looked at Clark and took aim at the upper-left corner. Clark didn't have a chance. And Bob Dieterle, in his final game as Archbishop Spalding's coach, got to watch his players celebrate another championship. It was the perfect ending to an 11-year tenure. GOALS: AS – Bryant, Patterson; MCD – Holmes, Andrzejewski. PENALTY KICKS: AS – Martin, Connor, Bryant, Patterson; MCD - Andrzejewski (miss), Pearson, Bialczak (miss), Robinson. ASSISTS: AS – Heck; MCD – Pearson. SAVES: AS – Babin 14; MCD – Clark 3. SHOTS: AS – 17; MCD – 27. CORNERS: AS – 3; MCD – 5. Archbishop Spalding senior midfielder Kelly Patterson was caught in the moment. Asked if there was any doubt where she planned to shoot her penalty kick — the one that gave the No. 5 Cavaliers the Interscholastic Athletic Association of Maryland A Conference girls soccer championship against No. 1 McDonogh on Monday night — she said with a smile: "Same spot every time." Patterson found the top left corner to clinch the penalty kick shootout by a 4-2 margin for the Cavaliers, who captured their fourth league championship at Stevenson University. The game was tied at 2 through 100 minutes of soccer, Patterson tied the game with 2:21 left in regulation . For Spalding, Sarah Martin, Victoria Connor and Gracyn Bryant scored goals and goalkeeper Cassidy Babin made two brilliant saves in the shootout to set the stage for Patterson. In handing the two-time defending conference champ and No. 1 Eagles (16-3) their first league loss of the season, the Cavaliers finish out the season with a 15-3-3 mark. Coach Bob Dieterle, who was coaching his final game with the team along with assistant coach Bob Wagner, leaves the program with a 173-24-21 mark and four titles in eight championship games . "They just never quit, they just never gave up — even when it looked like it was curtains in regular play. But it's been like that all season and found a way to win," he said. After freshman Bridgette Andrzejewski gave McDonogh a 2-1 lead with a blistering shot from 20 yards with 17 minutes left, it appeared the Eagles had what it would take to win a third straight championship. But the Cavaliers kept pushing. With 2:21 to play, Julia Heck sent a pass to Patterson, whose shot just crossed the goal line as a McDonogh defender tried to clear it away. Both teams had chances in 20 minutes of overtime , but weren't able to break through to set up the penalty kicks. Martin, Connor and Bryant all went to the right side to find success on their penalty kicks before Patterson went left for the championship decider. "It was unreal," Patterson said. "We just talked about this being our goal the entire season and we finally did it – it's just awesome." Mo Ostrowski scored her first varsity goal to ensure Archbishop Spalding a soccer title as a freshman. Three years later, she’s hoping to make her last just as memorable. Ostrowski, whose three goals helped knock out Notre Dame Prep on Saturday, will lead the Cavaliers as they aim to take down two-time defending Interscholastic Athletic Association of Maryland A Conference champion McDonogh in the final at 7 p.m. Monday at Stevenson University. Following a five-game patch in the middle of the season that included a scoreless tie against Good Counsel and 1-0 losses to McDonogh, Bryn Mawr and John Carroll, Archbishop Spalding been clearing its path to a seventh final appearance in eight years. Led by Ostrowski, a balanced offensive attack and a lock-down defense, the Cavaliers have won the final eight games by a combined score of 31-2. They doled Mount de Sales a 4-0 loss before wiping away the Blazers, 5-0, in the semifinal. All that’s left are the Eagles. McDonogh (17-1), which suffered its only loss to Bishop O’Connell on Oct. 25, mirrored the Cavaliers during the postseason by beating Severn, 4-0, and John Carroll, 5-0, to score its third straight championship bid. The Eagles are loaded with young talent and experience. Casey Martinez, who scored the overtime winner in the 2010 final, directs an offense that hasn’t missed a step even with the graduation of Ashley Spivey and Taylor Cummings — huge pieces of their last two title runs. Anna Bialczak scored two goals to beat the Patriots on Saturday, and Bridgette Andrzejewski — a freshman — had one in the second half. Stefani Holmes’ corner-kick header in the 49th minute was the only dent McDonogh put on Archbishop Spalding during a 1-0, regular-season win on Sept. 28. The Eagles took 26 shots against the Cavaliers, but managed to put only nine on frame in large part because the defense didn’t allow many close chances. McDonogh, which pulled out a 5-4 win against Good Counsel — at one time the top team in the country — on Oct. 15, has scored 54 goals in 12 conference games. The only team to allow just one is Archbishop Spalding. Since taking a 1-0 loss to John Carroll — a team it beat, 5-0, at home — Archbishop Spalding has been on an offensive tear. Ostrowski’s scored 10 of her 16 goals during the last seven games. Sarah Ensor, Laikyn Duffey and Gracyn Bryant scored during the second half in the win against the Sailors, and Julia Heck and Kelly Patterson added goals after Ostrowski’s third hat trick on Saturday. The Cavaliers have gotten goals from 14 players this season and have outscored their opposition, 53-9. They also have six shutouts during the last seven games — and five straight going into the final. Dieterle, who has a 172-24-21 career record and three A Conference titles in 11 years at Archbishop Spalding, and assistant coach Bob Wagner will be coaching for the final game. Told in the summer that his contract wasn’t renewed, Dieterle and the rest of his team have played the entire season building to this day. Mo Ostrowski isn’t finished playing soccer at Archbishop Spalding. She made sure Notre Dame Prep learned that early. Ostrowski scored twice during a nine-minute stretch in the first half and added another in the second to lead the Cavaliers to a 5-0 victory and into the Interscholastic Athletic Association of Maryland A Conference final for the sixth time in seven years on Saturday. Ostrowski, who’s scored 10 goals during the last seven games, intercepted Victoria Niller’s errant clear and drilled the ball off goalkeeper Victoria Gabor’s finger tips for a 1-0 lead in the 13th minute. Ostrowski caught Gracyn Bryant’s rebound off Casey Clarke’s block nine minutes later and cashed in on a 20-yard shot. Ostrowski got her third goal — the second time in three games she’s reached that total — on the Cavaliers’ first shot in the second half to make it 3-0. Archbishop Spalding (14-3-3) will play McDonogh — a 5-0 winner against John Carroll in the other semifinal — in the final at 7 p.m. Monday at Stevenson University. The Eagles pulled out a 1-0 win during the regular-season meeting on Stefani Holmes’ second-half goal. The Cavaliers, who lost the last two championship games to McDonogh, have outscored their opposition, 31-2 during an eight-game win streak. Julia Heck fed Kelly Patterson on a breakaway goal in the 14th minute and came right back to deposit a pass from Sarah Martin by Gabor to push the lead to 5-0. Cassidy Babin only needed to make three saves to set up Spalding’s 11th shutout. She only saw one shot in the first half — Shannon Ogrysko’s offering off a failed clear with 1:30 to play — and stopped two in the second. The Blazers’ best chances came in the 41st minute, but they couldn’t capitalize on either. The ball landed at Sarah Frey’s feet in the center of the box, but she couldn’t get through the defense. Colette McGarvey tried a few seconds later in the same spot, but Babin got to the ball. Ostrowski was a big reason, too. The team leader with 16 goals — Heck is second with seven — Ostrowski put the Cavaliers up early and consistently added pressure until she got her second. Laikyn Duffey set up Ostrowski during the 54th minute with a centering cross from the right sideline. Ostrowski dribbled down the left, shook French off with a move to the right and fired to the far post for a 3-0 lead. Spalding handed Mount de Sales a 4-0 loss on Thursday. Ostrowski scored then and got three more against the Blazers. But there’s still one more game to play. GOALS: AS — Ostrowski 3, Patterson, Heck. ASSISTS: AS — Duffey, Heck, Martin. SAVES: NDP — Gabor 4; AS — Babin 3, Willard 1. SHOTS: NDP — 5; AS — 14. CORNERS: NDP — 1; AS — 1. Reaching the Interscholastic Athletic Association of Maryland A Conference championship game has become old hat for Archbishop Spalding girls soccer coach Bob Dieterle. With Saturday's 5-0 semifinal win over Notre Dame Prep, he has now guided the No. 5 Cavaliers to seven appearances in the past eight years. But Monday's title game against No. 1 and two-time league champion McDonogh (game time set for 7 p.m. at Stevenson University) will be extra-special for Dieterle, who said Saturday that he is leaving the program after 11 seasons. Archbishop Spalding opted not to renew his contract after this year. Dieterle, who owns an accounting firm and also coaches club soccer and runs camps, has a house with his wife, Patti, in Rehoboth Beach, Del., and plans to pursue coaching opportunities there. Dieterle's record stands at 172-24-21 with three IAAM championships after Saturday's semifinal win, and he has coached several players who went on to enjoy Division I college careers and beyond. The most notable is 2008 Archbishop Spalding graduate Christine Nairn, who went on to play at Penn State and is currently on the U.S. women's national team roster. Dieterle turned the Spalding program into an area powerhouse that also has received national recognition in past years. The Cavaliers reached No. 1 in the country in the NSCAA and ESPN polls on two occasions in two previous seasons. "It's been an amazing trip. I've really enjoyed coaching with my assistant Bob [Wagner] and we've just had a blast working with the girls," Dieterle said. "We defined our goal and asked: 'Where do we want to be?' And we wanted to be the best that we could and we thought that included being champions of the league. So right away, we set out to play the best teams we could because we thought the only way we would get better was to play against the better teams." 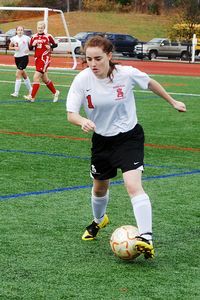 Returning 2011 IAAM All – Star, Madeline “Mo” Ostrowski, is the leading scorer on the girls’ soccer team this year with 12 goals and 2 assist. Mo has lead the team to their current 7 game winning streak scoring 9 goals and 2 hat tricks, 3 goals against NDP and 3 goals against Glenelg. Mo’s speed and talent on the field has earned her player of the week by the Baltimore Sun, Capital Gazette and the IAAM. As team captain Mo not only demonstrates leadership on the field, but also in the community with over 45 hours of community service. As a National Honors Society student Mo is also a standout in the classroom. We are proud to announce Madeline as our October student-athlete of the month. Like the rest of her teammates, Sarah Ensor wasn’t in the mood to hear friends tell her Thursday’s game with Mount de Sales would be easy. Though Archbishop Spalding won its Interscholastic Athletic Association of Maryland A conference quarterfinal against the Sailors, even the 4-0 final score was deceiving. The Cavaliers’ consistent pressure was matched by the Sailors’ gritty defense for 32 minutes until Ensor scored the opening goal with 13 to play in the first half. Mo Ostrowski, Laikyn Duffey and Gracyn Bryant added second-half tallies for Archbishop Spalding's seventh straight and fifth in six games despite limited practice time and cold conditions due to Hurricane Sandy. Winners of the A Conference’s Red Division, the Cavaliers advance to Saturday’s semifinal against Notre Dame Prep – 2-0 winners over Mercy. But before the Cavaliers could plan for the Blazers, they had to overcome Mount de Sales. Despite a 1-16-2 record, the Sailors took a 2-1 loss to Archbishop Spalding on Sept. 21 and dropped a 2-1, overtime decision last week to McDonogh, the A Conference’s Gold Division champion. For most of the game’s first half, the Cavaliers carried the ball into the offensive zone, but the Sailors squeezed the point and forced a bad pass to cause frustration. Finally, Sydney Borum dribbled the ball out of the far right corner and lifted a centering pass to the goal mouth. Ensor made her move to the goal and booted the ball over Mount de Sales goalkeeper Sydney Hunter for a 1-0 lead. That second goal came from Ostrowski, who leads the Cavaliers with 26 points. Ostrowski deftly carried the ball from the left side to Hunter’s right before gently pushing it past the left to make it 2-0 with 29 minutes, 27 seconds left. The goal forced Mount de Sales to pressure even more. Like trying to catch anything rolling downhill, the more the Sailors tried to press, the harder it became to keep Archbishop Spalding from scoring. Duffey scored less than five minutes later to make it 3-0, and Bryant added the final tally with just less than 13 minutes remaining. Mount de Sales tied Notre Dame Prep, 0-0, lost six one-goal games and ended the regular season with a 1-0 win – over Bryn Mawr. Now Archbishop Spalding readies for Notre Dame Prep on Saturday. The Cavaliers tied the Blazers, 1-1, on Sept. 14 and posted a 3-0 win on Oct. 17. GOALS: AS – Bryant, Duffy, Ensor, Ostrowski. ASSISTS: AS – Borum, Kelly, Martin. SAVES: MSD – Hunter 8; AS – Babin 3, Willard 2. SHOTS: MDS – 6; AR – 14. CORNERS: MDS – 3; AS – 5. The senior forward, in her fourth varsity season, helped the No. 5 Cavaliers (11-3-3) wrap up the Red Division in the Interscholastic Athletic Association of Maryland A Conference. In five wins last week, Ostrowski accounted for six goals and an assist to help the Cavaliers go into the league playoffs on a high note. In a 2-1 win over then-No. 3 C. Milton Wright on Oct. 15, Ostrowski assisted on the game-winning goal. In a 3-0 league win over Notre Dame Prep on Wednesday, she scored all three goals to record her second hat trick of the season. She added one goal in a 3-1 league win over Severn on Friday and added two goals in a win over Kenwood. Ostrowski, who has a 3.75 grade point average, is still weighing her college options with the Naval Academy and UMBC among her top choices. For the season, she has nine goals and two assists. Ostrowski scored six goals and had two assists during the Cavaliers’ 5-0 week that clinched a top seed in the IAAM A Conference playoffs. Ostrowski assisted Vickie Connor in the second half Monday to hand C. Milton Wright its first lost and scored three goals two days later to push Archbishop Spalding to a 3-0 win against Notre Dame Prep. Ostrowski, a four-year varsity player, scored during a 3-1 beating of Severn that clinched first place on Friday and went for two more in a 5-0 win against Kenwood in the second game of a doubleheader. Six missed shots didn't shake Mo Ostrowski. She knew the goals would come. Ostrowski got a boost by Kelly Patterson's score in the 23rd minute and put added three more in the second half to give Archbishop Spalding a 5-0 win over Glenelg on Monday. The Cavaliers (12-3-3), who locked up the division title and a top seed in the Interscholastic Athletic Association of Maryland A Conference soccer playoffs by beating Severn on Saturday, have won their last six games, while outscoring the opposition, 22-2. Ostrowski scored five minutes after Patterson for a 2-0 lead and took the ball around Rachel Nichols on the left side to bury a shot by Lindsey Mazer with 26:34 to go. Less than two minutes after Sarah Martin cashed in on a 25-yard shot, Laikyn Duffey found Patterson on the right side to set up a cross for Ostrowski, who headed the ball in on the left post to make it 5-0. Ostrowski scored six goals and assisted on two to help Archbishop Spalding win five games – including previously-undefeated C. Milton Wright. Mazer stopped 13 shots, but the Cavaliers took 38 of them – three of which hit the crossbar. Ostrowski missed six of their first 12 shots before Patterson capitalized on the 13th. Patterson dribbled the ball into the left corner and pulled Nichols and Emily Taylor deeper to set up a shot on the right post for a 1-0 lead with 17:45 left in the first. The Gladiators, who beat Archbishop Spalding for the first time in 11 chances last year, managed only three shots – one in the first 46 minutes. Cassidy Babin caught Kathleen Mensing's early offering on the right side and grabbed Jenna Caffey's roller with 19:50 to play for her ninth shutout. Glenelg spent most of its time on defense. Taylor blocked Samantha Kirk on a corner during the sixth minute before Ostrowski missed on back-to-back chances. Gracyn Bryant set up Ostrowski in front, but Mazer ranged to her right to make the save. Ostrowski laced her next shot off the middle of the crossbar, but still didn't have a goal. “Sometimes you don't have to score if you put the fear of God in the other team,” Cavaliers coach Bob Dieterle said. Ostrowski finally scored in the 28th minute with a shot on the left side. She took a pass from Duffey and charged into the box with 26:34 to play and drilled a high shot off Mazer's hands and watched the ball bounce into the goal. Shortly after coming in for a substitution, Martin stopped in the center with the ball and sent a shot into the upper-right corner for a 4-0 lead. Before leaving the field with Bryant, Ostrowski added one more goal on a left-side header. Duffey delivered an outlet pass to Patterson, who took a few steps down the right side before catching Ostrowski on the left. Patterson lined a pass into the box for Ostrowski, who headed it by Mazer to send the Cavaliers into the postseason on a six-game win streak. GOALS: AS – Ostrowski 3, Patterson, Martin. ASSISTS: AS – Duffey, Patterson, Kelly. SAVES: GLE – Mazer 13. SHOTS: GLE - 3; AS – 38. CORNERS: GLE – 1; AS – 10. Posted: Friday, October 19, 2012 8:27 pm | Updated: 9:57 pm, Fri Oct 19, 2012. With a home playoff game assured with a win, Sarah Martin wasn’t afraid to let it fly. Martin scored two picturesque goals from distance to help lead Archbishop Spalding past Severn, 3-1, on Friday to close out its Interscholastic Athletic Association of Maryland A Conference regular season. “I knew this game was really important, so I had to finish my shot and step up my game,” Martin said. Possessing the ball from around 35 yards out, Martin found some space and launched it from her left foot with power and movement over goalkeeper Alayah Hightower 15 minutes into the game. It gave the Cavaliers the early edge, but they couldn't retain it for long. Just eight minutes later, a good combination of effort and skill allowed the Admirals to even the score. Morgan Kontor hustled to win a ball and took off up the right side to make a cross, which she centered perfectly for Kelsey Ritter, who knocked it past Cassidy Babin. Feeling confident, it was Martin who gave the Cavaliers the lead for good – again seemingly creating a scoring chance out of nothing. She possessed the ball at nearly an identical spot from her first goal and fired another left-footed rocket that curled into the top right corner. The goals left Severn coach Adam Ritchie a bit frustrated – mostly because they came from nearly the same spot. The Cavaliers gave themselves some breathing room when Mo Ostrowski scored less than five minutes into the second half. After settling the ball on the left side of the box, Ostrowski worked herself into a good position and let it fly from distance, where it found the top right corner. Ritter came close to pulling one back when she fired a bending free kick from 25 yards out, but Babin leaped to tip it over the bar. After playing their past six games on the road combined with injuries issues, the Cavaliers have found a way to bond and overcome adversity. Dieterle is pleased with the mindset of the team as it moves toward the playoffs having clinched the top seed in the A Conference's Red Division. For Severn, it’s been a positive debut in the A Conference as it will most likely finish third in the division and take on Mercy in the first round of the playoffs. GOALS: AS - Martin 2, Ostrowski; SE - Ritter. ASSISTS: SE - Kontor. SAVES: AS - Babin 3; SE - Hightower 3, Gibbons 3. SHOTS: AS - 16; SE - 7. CORNERS: AS - 3; SE - 1. Sarah Martin scored twice and Madeline Ostrowski added another to power No. 6 Archbishop Spalding girls soccer team past host Severn, 3-1, Friday. 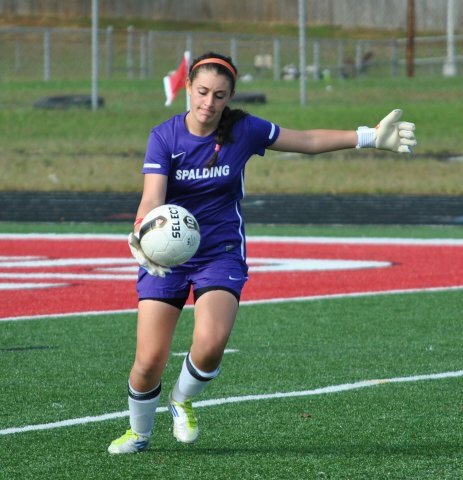 Archbishop Spalding goalkeeper Cassidy Babin, a second-team All-Metro selection last year, has made a commitment to play soccer at Massachusetts. In her second season starting this fall, Babin is 6-3-3 with five shutouts, 54 saves and seven goals allowed for the No. 4 Cavaliers. ARCHBISHOP SPALDING 3, NOTRE DAME PREP 0: Mo Ostrowski’s hat trick was all the Cavaliers needed in their victory over the Blazers. Sarah Martin, Lauren Kelly and Samantha Kirk assisted on the goals, and Cassidy Babin made five saves. GOALS: AS - Ostrowski 3. ASSISTS: AS - Martin, Kelly, Kirk. SAVES: AS - Babin 8, Willard 0; NDP - Gabor 6. SHOTS: AS - 9; NDP - 5. CORNERS: AS - 4; NDP - 2. Victoria Connor had a goal and an assist, and Sydney Borum added a goal as No. 5 Archbishop Spalding High defeated second-ranked C. Milton Wright, 2-1, in a non-league girls' soccer match in Bel Air Monday afternoon. Madeline Ostrowski added an assist and goalie Cassidy Babin stopped five shots as the Severn school (7-3-3 overall) rebounded from a loss last week to IAAM A Conference rival John Carroll School, knocking it out of the No. 2 spot in VSN's Top 20. The Cavaliers had held the position since the start of the 2012 campaign. C. Milton Wright (11-1-1), which came in Monday's match one of three unbeaten area squads (River Hill and Arundel), got a goal from Kathy Kramerer in the second half. Angela Kuhn provided the assist. The Mustangs look to rebound Thursday at UCBAC Chesapeake rival and No. 9 Fallston, with the division crown on the line. Spalding heads to Notre Dame Prep Wednesday afternoon in an IAAM A match. Cassidy Babin, behind a solid back, posted the shutout Wednesday as No. 2 Spalding knocked off Mercy. Stingy defense and timely scoring was again recipe for success for Archbishop Spalding High girls' soccer team. The No. 2 Cavaliers defeated No. 7 Mercy, 2-0, in an IAAM A Conference battle on Northern Parkway Wednesday afternoon. Lauren Kelly and Sydney Borum each tallied for the Severn school while Cassidy Babin needed just two stops to post her fourth shutout. The Cavaliers (6-1-3 overall) solidified their spot atop the IAAM A Red Division at 4-1-1. Borum, a reserve midfielder starting in place of injured Gracyn Bryant, sent a through ball to Kelly, who finished for the game's opening score late in the first half. Borum scored her first goal of the season in the second half. Midway through the season, the No. 2 Archbishop Spalding girls soccer team has displayed a strong defense, creative midfield and capable goal scorers up front. In Wednesday's 2-0 win at No. 13 Mercy, the Cavaliers showed off another important aspect: team depth. With senior standout midfielder Gracyn Bryant sidelined with an injury, junior reserve Sydney Borum saw more playing time than usual. She made the most of the opportunity, setting up Lauren Kelly's opening goal with a nifty through ball in the closing seconds of the first half before adding a late insurance goal to help send the Cavaliers home with a win over the Magic. The assist and goal were the first of the season for Borum. Spalding improves to 6-1-3 overall and further secures the top position in the Interscholastic Athletic Association of Maryland A Conference's Red Division with a 4-1-1 mark. Mercy (8-6) is 4-3 and in second place in the league's Gold Division. The Cavaliers defense was flawless throughout the game, giving Mercy limited time and space with goalkeeper Cassidy Babin easily handling two shots. The Magic were equally stingy for the first 39-plus minutes until Borum collected a ball at midfield and sent a ball in long to the left for Kelly, who took a couple touches before unleashing a left-footed shot from 8 yards past Mercy goalie Madison Collins for the first goal that came with 10 seconds left in the first half. "It was a real catalyst for us. We tried a few different things and they didn't seem to be working very well. Sydney came in, got the ball and gave an amazing ball and Lauren did the right thing. She attacked, didn't wait and slow down and ripped it," said Spalding coach Bob Dieterle. The 1-0 advantage was well protected in the second half with defenders Vickie Connor, Katherine Stockford, Brandi Shehade and Jocelyn Wagner giving up no ground. Mercy midfielder Lauren Crusse worked the ball to the left edge of the penalty area 10 minutes into the second half, but Connor stayed step for step to block the attempted shot. Hannah Goff hit one from 30-plus yards, but Babin had no difficulty making the save. Cassidy Babin, Jr. Archbishop Spalding, soccer. Babin played 160 minutes against Good Counsel and McDonogh last week and allowed just one goal. The anchor to the Cavaliers' defense over the last two years. Babin collected seven saves in a 0-0 tie with the Falcons on Wednesday before grabbing eight more in a 1-0 loss to the Eagles. The only goal Babin allowed came in the 49th minute on Stefani Holmes' header. Babin has given up just four goals all year. It was evident early in Friday night's girls soccer showdown between No. 1 McDonogh and No. 2 Archbishop Spalding that whatever ground that was to be gained would have to be well earned. Balls at midfield were fiercely challenged and any forward progress was met with defensive resistance. The high level of competition has become the norm when the two teams have played in recent years, making it the area's finest girls soccer rivalry. Coming out strong in the second half and sensing an advantage, McDonogh, two-time defending Interscholastic Athletic Association of Maryland A Conference champion, was able to break through when junior midfielder Steffani Holmes headed home a corner kick sent in by senior defender Jordan Pearson. The goal, coming with 31 minutes to play, would hold as the visiting Eagles protected the advantage with a continued strong push that led to a 1-0 win over the Cavaliers. McDonogh improves to 8-1 overall and 5-0 in the IAAM, while Spalding falls to 5-1-3 and 3-1-1 in league play. After earning a second straight corner kick, Pearson sent an ideal ball right to the middle — just far enough from Spalding goalkeeper Cassidy Babin, yet close enough for Holmes to run on to firmly head home the ball for her first goal of the season. "I was just honored to score the goal," said Holmes, who plays defensive central midfielder. "Everybody worked so hard every day in practice and set pieces is one of the things that we do work on. I'm just glad to be the one to finish. It was surreal, very hard to explain. It was great cross from Jordan — perfect, right on the dot." The Cavaliers came out fast and played better in the first 20 minutes, but they were unable to take advantage with any solid scoring chances. The Eagles, who got strong play from junior midfielder Casey Martinez and freshmen forwards Kia Rankin and Bridgette Andrzejewski, began to settle in as the half wore on and then fully found their offensive flow in the second half. "Halftime it was all about … how we need to get back into our rhythm, and play together as a team, and calm it down for ourselves and not play frantic. So that's what we tried to do and I think we did it pretty well," Martinez said. The Cavaliers created chances late, but were unable to find the tying goal. Sarah Ensor had a step on a defender to gain space in the middle, but her left-footed shot from 14 yards ended up wide of the goal. Babin led the Cavaliers' strong defensive effort with eight saves. Spalding coach Bob Dieterle said he learned a lot about his team in the past two days. On Wednesday, the Cavaliers earned a 0-0 draw at Good Counsel, which came into the game ranked No. 1 in the country by the National Soccer Coaches Association of America. "As I said to them coming in 'You're not going to win or lose the championship this week, but you are going to learn something about yourself.' And what they learned is that they're a really good team, really good teammates and everybody left it on the field. We played two really good teams in 48 hours and we gave up one goal," he said. Posted: Saturday, September 29, 2012 12:00 am | Updated: 2:57 am, Sat Sep 29, 2012. During one of the toughest three-day stretches any soccer team in Maryland will play, Archbishop Spalding didn't allow a goal for 129 minutes. Stefani Holmes finally found a way. Jordan Pearson made the most of a second opportunity on a corner kick and set up Holmes for a header in the 49th minute to send McDonogh to a 1-0 victory on Friday. Marcela Robinson couldn't convert Pearson's first insert on a penalty kick, but her shot was deflected out of play. Pearson dropped another pass into the box for Holmes, who broke to the right side and headed a shot by Cassidy Babin to put the Eagles in front. It was Holmes' second career goal and gave McDonogh its fourth straight win against the Cavaliers (5-1-3). Following a 0-0 tie on Wednesday against Good Counsel – the No. 1 team in the country – the Cavaliers were able to get an offensive jump on the Eagles, but struggled to get through the back line. They put just one shot on goal during the first half and missed their marks on several in the second. Just as it did against the Falcons, Archbishop Spalding dictated the pace early. Bryant pushed a quick pass off a corner to Laikyn Duffy in front of the goal in the sixth minute, but her shot sailed high. Lindsey Clark made a save on Marissa Brown's shot on the right post with 17:10 left in the first, and Bryant's 25-yard offering five minutes later missed high. McDonogh, which outscored its opposition, 30-2, during the first six games, kept Babin busy. Babin caught Holmes' shot from the center two minutes into the second half, and she batted away Kia Rankin on the Eagles' next two chances. After getting just one corner kick in the first half, the Eagles got two in a 30-second span during the second – and made sure they take advantage. Holmes broke through the pack deep in the penalty box to receive Pearson's second insert and buried a header into the upper-right corner of the goal to make it 1-0 with 31 minutes to go. Spalding, which hasn't scored against McDonogh since the 2010 Interscholastic Athletic Association of Maryland A Conference final, took five shots in the second half – all in the last 18:45. Sarah Ensor worked around Martinez in the 63rd minute, but sent her shot wide, and Clark came out of the box to spoil Duffy's chance on a loose ball on the next play. Sarah Martin's drove a free kick wide to the right by a yard with 6:36 to play. Julia Heck fed a through-ball to Brown, who was charging down the middle, and beat Robinson for an open shot that curled to the right of the goal. If Archbishop Spalding gets another chance to beat McDonogh, it'll be in the championship game. The Eagles have won the last two titles, while the Cavaliers watched them celebrate. GOALS: MCD – Holmes. ASSISTS: MCD – Pearson. SAVES: MCD – Clark 1; AS – Babin 8. SHOTS: MCD – 26; AS – 9. CORNERS: MCD – 6; AS – 2. OLNEY — Mo Ostrowski had the ball at her feet with three minutes to play, took a quick shot and watched it land in the goalkeeper’s hands. It was like that all night — for both teams. Cassidy Babin and Alicia Chavez matched each other in goal, while their defenses set the tone to leave Archbishop Spalding and Good Counsel in a scoreless tie on Wednesday. The No. 1 team in the country, according to the National Soccer Coaches Association of America poll, the Falcons (6-0-1) allowed just one goal in their first six games. But they were playing without national team member Midge Purce and Imani Bailey — their two leading scorers. The Cavaliers took advantage. They put three of their seven shots in frame and took six corners in the first half, but Chavez and her defense turned every opportunity away. Sarah Martin’s shot from the right corner sailed over the crossbar in the 23rd minute. She followed with three consecutive corner kicks, but Karli Cirovski, Jordyn Brock and Hollie Byer took turns clearing the threats. Martin took a shot on the inside with 14:10 to play in the half, but Chavez came up with the save on the right post. All the pressure nearly paid off in the 31st minute when Kelly Patterson found Lauren Kelly just inside the box for a line drive to the left post. Chavez got a good jump and slid to make the save and keep it scoreless. Good Counsel, which has outscored its opposition, 17-1, put only five shots on goal to make things easy on Babin, who recorded her fourth shutout. Maddie Pack dropped a pass on the outside of the goal box for Brock with 33 minutes left, but Babin raced to the ball to prevent a shot. Cirvoski sent a right-side offering seven minutes later that Babin handled easily, and Julia Abbott’s shot with 9:49 to go didn’t make a dent. Abbott took a short pass from Kelsey Daley on the left side and worked around Vickie Connor with 4:48 left, but Babin was there again. Gracyn Bryant fought through double teams all game and nearly put the Cavaliers ahead with 41 seconds remaining in the first half, but her shot on the left post was a couple feet wide. Ostrowski dribbled the ball down the left side of the field early in the second half and pulled up near the 18 to take aim at the net, but pulled it wide. She got one more chance when Laikyn Duffey threw the ball at her feet with 2:40 left. Ostrowski fired a quick shot on the right post — and into Chavez’s hands again. Archbishop Spalding tied Bishop O’Connell and Notre Dame Prep earlier this season and has to play McDonogh on Friday in a rematch of the last four Interscholastic Athletic Association of Maryland A Conference finals. The Falcons likely won’t have the top spot in the country for long due to the tie. With Purce and Dorsey coming back, though, a tie against one of the better teams in Maryland won’t resonate for long. SAVES: AS — Babin 5; GC — Chavez 4. SHOTS: AS — 9; GC — 13. CORNERS: AS — 6; GC — 4. Ensor helped the Cavaliers recover from a 2-2 tie to Notre Dame Prep by assisting her teammates in wins against Severn and Mount de Sales last week. Ensor, one of the many strikers Bob Dieterle has at his disposal, delivered two crisp passes that led to goals in a 3-0 victory over the Admirals on Wednesday and dished another to Julie Heck to beat the Sailors on Friday. Coming into the season, Bob Dieterle knew his girls soccer team had a good shot to get back to the conference final. After sitting through an injury-plagued 2011, he returned just about everyone and boasted experience on both sides. Archbishop Spalding’s 5-0-2 record so far isn’t much of a surprise. In a 3-0 victory over Severn last week, the Cavaliers’ depth was the key. Marissa Brown, Julia Heck and Gracyn Bryant scored goals, while Sarah Ensor — a natural striker — was there to feed them. Two days later, Ensor and Heck combined to help knock off Mount de Sales, 2-1. Then there’s Mo Ostrowski, whose three goals are second to only Heck’s six. Archbishop Spalding, which has lost to McDonogh in the last two Interscholastic Athletic Association of Maryland A Conference soccer finals, has already handed John Carroll a 6-0 loss. Its only blemishes are 1-1 ties to Bishop O’Connell and Notre Dame Prep. The Cavaliers will be tested this week, though. They’ll play Good Counsel on Wednesday before drawing McDonogh Friday. Ranked No. 1 in the National Soccer Coaches Association of America poll, the Falcons (6-0) have outscored their opposition, 17-1. They beat Pennington, an 11-time New Jersey state champion, 3-0, and boast leading scorer Midge Purce, a national team member. The Eagles (6-0) have allowed just one goal — in a 3-1 victory over Mercy despite losing Ashley Spivey and Taylor Cummings from their potent offense. They still have Casey Martinez, who scored the winning goal in the 2010 conference final, and several other pieces. McDonogh beat South River and Severna Park in the Pioneer Classic. But Archbishop Spalding isn’t worrying about what Good Counsel and McDonogh have done. All the players are focusing on is getting better and making sure they’ve got a shot to end their two-year losing streak in the conference championship game. ARCHBISHOP SPALDING 2, MOUNT DE SALES 1: Julia Heck’s goal in the 66th minute was the difference as her Cavaliers defeated the Sailors. 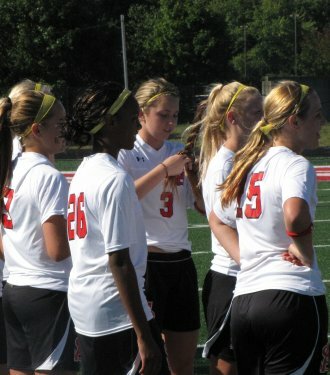 Heck was assisted on the goal by Sarah Ensor, who scored the first goal for Spalding on an assist by Kelly Patterson. Jocelyn Wagner led a staunch Cavalier defense that only allowed one shot in the game. GOALS: MDS - Jurney; AS - Ensor, Heck. ASSISTS: AS - Ensor, Patterson. SAVES: MDS - Hunter 9; AS - Babbin 0. SHOTS: MDS - 1; AS - 10. CORNERS: MDS - 3; AS - 3. Marissa Brown and Julie Heck had just enough time to react. With the way Sarah Ensor was passing, that’s all they needed. Ensor sent a deep cross to Brown late in the first half and flipped a pass inside the goal box for Heck in the second to help Archbishop Spalding navigate to a 3-0 girls soccer win against Severn on Wednesday. Archbishop Spalding dominated possession during the first half and relied on its steady back line in the second before Heck doubled the lead in the 68th minute. Gracyn Bryant added a penalty kick with 2:57 left to prevent a comeback. The Cavaliers (4-0-2) made up for last year’s 1-0 loss — the first time the Admirals every came away with a win — by taking 23 shots and allowing only eight. Cassidy Babin needed to make just four saves for her third shutout in four games. Severn took six shots in the second half and had a chance to make it 1-1 in the 62rd minute. But miscommunication between Cami Whiteford, Kelsey Ritter and Morgan Kontor on a loose ball just inside the 18-yard box gave the Cavaliers time to clear it. Seven minutes later, the Admirals were staring at a 2-0 deficit and a 1-4 start in their first season in the Interscholastic Athletic Association of Maryland A Conference. The Cavaliers’ plan was simple. Find the open players and use their speed to exploit the defense. Ensor carried the ball across the midfield and spotted Brown sprinting toward the goal. Ensor drove the ball to right corner of the 18-yard box — just missing Heck’s head — and Brown put a shot past goalkeeper Carolyn Exarhakis for a 1-0 lead. Ensor was in the middle of the next goal, too. Bryant sent a cross from the right corner to the front. Guarded tightly, Ensor flipped a short pass inside the goal box for Heck, who just needed to put a foot on the ball for the score. Bryant picked up a foul in the box with three minutes to play and buried a shot into the upper-right corner to beat backup goalkeeper Alayah Hightower to make it 3-0. Behind five interchangeable strikers, the Cavaliers have outscored their opposition, 18-3, and have collected at least three goals in three games. Bryant, Brown and Mo Ostrowski have three goals, while Heck has five. The only games Archbishop Spalding hasn’t won are 1-1 ties to Bishop O’Connell and Notre Dame Prep. Severn controlled the possession for much of the second half, but couldn’t find a way past the defense. Kontor found Whiteford for a shot in the middle with 33:16 left, but Laikyn Duffey redirected it. Babin stopped Reese’s offering on the next trip and again on a cross 10 minutes later. GOALS: AS — Brown, Heck, Bryant. ASSISTS: AS — Ensor 2. SAVES: SE — Exarhakis 7, Hightower 4; AS — Babin 4. SHOTS: SE — 8; AS — 23. CORNERS: SE — 5; AS — 6. Head Coach Bob Dieterele quickly points out that Team Captain Madeline "Mo" Ostrowski has been carrying much of the success of the Cavs for the last three years, as the 8th All-Time scorer, with 24 goals, in the team's history. Double and triple-teamed, Ostrowski was key in the last two wins by the Cavs. In a 6-0 victory over Bel Air High School, Mo was masterful, scoring three goals and in the 5-0 win in their IAAM "A" Conference opener, Mo provided an assist in that win over John Carroll. 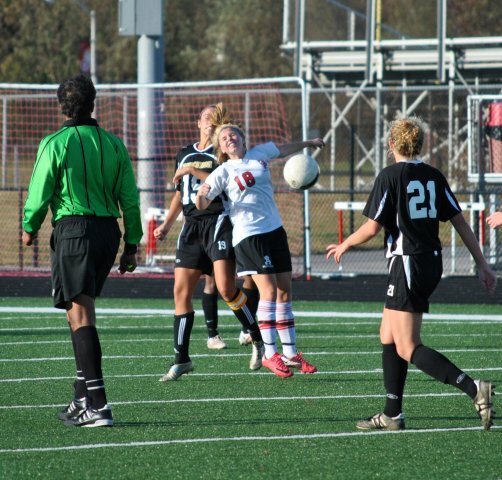 Spalding routs soccer rival John Carroll12:00 pm, Thu Sep 13, 2012. Spalding routs soccer rival John Carroll By RYAN MORSE, Staff Writer CapitalGazette.com | 0 comments When John Carroll and Archbishop Spalding get together, it’s normally a tense affair that often comes down to the wire, including last year’s Interscholastic Athletic Association of Maryland A Conference semifinal.The Cavaliers won that one on a header in overtime.“I’ve been here 11 years,” Archbishop Spalding coach Bob Dieterle said. “We’ve played them about 14 times and every one has been a nail-biter.”There was no such tension on Wednesday as the Cavaliers found the back of the net five times in the first half and were on cruise control throughout the second to knock off the Patriots, 5-0.Gracyn Bryant got the scoring started on an effort that would have made David Beckham proud. Bryant took the ball just outside the left side of the box and struck it so it curled and dipped into the top, right-hand corner — leaving the goalkeeper with no chance.After she had fired wide and high during the first six minutes, the third time was the charm.“We practice and practice shooting,” Bryant said. “We practice it all the time, and I missed the first two shots, so I said I better get the third one in.”The Cavaliers dialed up the pressure even more, notching their second goal just 42 seconds later. Kelly Patterson found space in the box, fired a shot on net that was saved, but the rebound came right back to her, and she promptly drilled it into the goal. Patterson finished with a goal and an assist.After trying several formations to start the season, the Cavaliers have clearly found one that suits their strengths — in particular, their speed.“The first couple of games, we tried a couple of different formations,” Dieterle said. “We settled on one and introduced it at Bel Air and really put pressure on them. We are going to bring a lot to bear with speed, be quicker to the ball, defend well as a team and put pressure on the goal.”Archbishop Spalding scored again at the midway point of the half when Brandi Shehade sent a long, floating ball that seemed to pick up speed from a flowing breeze. It caught the Patriots goalkeeper off guard, and she was only able to partially deflect it toward the net. Marissa Brown was there to make sure it wasn’t in doubt.“The ball went up in the air, and I saw the goalie hit it out, so I just touched it in for Brandi,” Brown said. “We were really motivated, and we wanted to come out strong because we knew it was a big game, so we really wanted to pressure them.”With 15:55 remaining in the first half, Brown was again in the right spot at the right time. Mo Ostrowski made a run into space on the left side and fired on net to force a save from Andrea Simpos, but Brown was trailing the play and pounced on the rebound to make it 4-0.In their new formation, the Cavaliers have been working on exploiting their opponents with speed from the outside.“We practiced hard all week,” Bryant said. “We have been working on getting the ball out wide, using our speed and working from outside in.”They concluded their scoring with that exact type of play when Sarah Martin finished a pass from Patterson after she had made a blazing run up the left side to leave a defender in her wake.Cassidy Babin was under little pressure in the victory and only had to make two saves to record the shutout.Afterward, John Carroll coach Gary Lynch had nothing but positive accolades for the Cavaliers. “They were more athletic, and they had a very good game,” Lynch said. “They played really, really well. Our weaknesses were under the microscope today, and they completely outplayed us. There is no consolation. They are physically much stronger than we are, and they are faster than we are.”Despite the rousing victory, Dieterle is sure they will see a better John Carroll team when they face them again in the new A Conference format, which has opponents play a home and away series.“With having to play them home and away, we knew we had to take advantage of being at home,” Dieterle said. “We know when go up there in October, they will be ready. Gary is a great coach, and he does a great job of improving his teams as the season goes on.”John Carroll (3-2) 0 0 — 0Archbishop Spalding (3-0-1) 5 0 — 5GOALS: AS — Brown 2, Bryant, Patterson, Martin. ASSISTS: AS — Patterson, Shehade, Ostrowski. SAVES: JC — Cooper 2, Cipos 3, Cumpston 1; AS — Babin 2. SHOTS: JC — 5; AS — 12. CORNERS: JC — 4; AS — 2. In recent years, the Archbishop Spalding-John Carroll girls soccer rivalry has been dominated by one-goal games, overtimes and a big save or dramatic goal often providing the difference. In Wednesday's Interscholastic Athletic Association of Maryland A Conference opener for both teams, Spalding wasn't having any of that. The No. 2 Cavaliers were decidedly faster to the ball and hungry in their attacking third of the field, scoring five goals in the first half of a stunningly comfortable 5-0 win over the visiting No. 5 Patriots. Marissa Brown scored two goals, Kelly Patterson added a goal and an assist and Gracyn Bryant and Sarah Martin also scored. Spalding improves to 3-0-1 on the season, while John Carroll falls to 3-2. "We just wanted to start off the conference season really well," Bryant said. "We were ready to play hard, and the past few years [against John Carroll] it seemed to gone to overtime every single time, but they played hard and we just played better." Bryant opened the scoring in the 10th minute with a neatly placed shot from 25 yards that found the upper-right corner. The Cavaliers quickly pushed the ball forward into the Patriots' penalty area, and after one shot was blocked, Lauren Kelly alertly dropped a pass back to Bryant for the 1-0 lead. That goal set the tone for the rest of the half. Less than two minutes later, Patterson pounced on a rebound in front to make it 2-0, then Brown scored consecutive goals five minutes apart midway through the half to put the game out of reach. The Cavaliers had the better of John Carroll the past two seasons — going 3-0-1, which includes two semifinal playoff wins — but the results were two 1-0 victories, a 2-0 win and a 1-1 draw. While two-time defending league champ and No. 1 McDonogh remain the team to beat in the A Conference, the Cavaliers have served early notice that they are primed for a strong run this season, while the younger Patriots will look to make steady progression as the season unfolds. "There's not much to be said, [Spalding] had a very, very good game," John Carroll coach Gary Lynch said. "We know where our weaknesses are, and they were all under the microscope today. They completely outplayed us. They're physically much stronger than we are, they're faster than we are. They play a very direct game, and we play a small build-up game, and they were able to knock us off the ball early on and we played poorly in the back." Goals: S – Brown 2, Martin, Bryant, Patterson. Assists: S – Patterson, Kelly, Ostrowski, Shehade. Saves: JC – Cooper 2, Sipos 3, Cumpston 1; S – Babin 4. Sophomore forward Marissa Brown claps as she leaves the game late in the second quarter. Archbishop Spalding girls soccer coach Bob Dieterle said he found a formation on offense against Bel Air on Monday that just clicked. The Cavaliers proved that a six-goal victory over the Huskies was no fluke as they stuck with the same formula against John Carroll. Behind a pair of goals by sophomore Marissa Brown, No. 2 Archbishop Spalding dominated the No. 6 Patriots in a 5-0 win in the IAAM A Conference opener for both teams on Tuesday afternoon. "In the first two games, we tried a couple different formations," Dieterle said. "We settled on one, and introduced it at Bel Air. As you can see, we put a lot of pressure on. I like the formation we're playing, and we have a lot of speed." The veteran Cavaliers were quicker to the ball, and used a physical defense to John Carroll (3-2-0 overall, 0-1-0 league) out of their style of play. "They completely out-played us,"Patriots coach Gary Lynch said. "They are physically much stronger than we are, and they are faster than we are. They play a very direct game, where we play a small build-up game. They were able to knock us off the ball early on." Senior midfielder Gracyn Bryant got the ball rolling for Spalding (3-0-1, 1-0-0) in the 10th minute with a laser shot from about 30 yards out. Bryant jumped in front the ball as a Patriot defender tried to make a clear. She rocketed a shot that bent into the far post and into the back of the net. "I missed my first two shots, so I had to redeem myself," Bryant said. "I opened my body and I saw that no one was near me. So then I just bent it in." Spalding continued to attack the goal in waves, outshooting their opponent 11-2 in the first half. Just two minutes after taking the 1-0 lead, senior Kelly Patterson put a shot on the cage that John Carroll goalie Katie Cooper was able to deflect. But the ball bounced right back to Patterson's foot, and she made good on the rebound. Brown added back-to-back scores -- thanks in part to helpers from Brandi Shehade and Mo Ostrowski -- to push the lead to 4-0. Sarah Martin capped the scoring in the 35th minute when she finished off a left-footed shot on a ball that was sent in by Patterson. "We played very well on offense,"Â? Brown said. "Our goal was to pressure a lot and score early. Getting that early lead gave us the confidence to keep pushing, as well as taking them out of the game." Dieterle called the past several meetings between the conference rivals as "nail-bitters"Â? that are usually decided by one goal. He knows that the match at John Carroll on October 10th will be a lot different. "Gary does a great job with his team, and I know they will be ready by the end of the season, Dieterle said. I'm not underestimating them." Goals: AS - Brown 2, Patterson, Bryant, Martin. Assists: AS - Patterson, Ostrowski, Shehade, Kelly. Saves: JC - Cooper 2, Cumpston 3, Sipos. AS - Babin 2. No. 2 Archbishop Spalding made the long northern journey from its Severn campus to Bel Air, on Monday afternoon, but the Cavaliers came off the bus with fresh legs as they routed 18th ranked Bobcats, 6-0, in girls soccer. Two Spalding players - Madeline Ostrowski and fresman Julia Heck split the goals, netting three each. Spalding led just 1-0 at the half, but powered in five second half tallies to notch the win. Heck added an assist, while Kelly Patterson, Gracyn Bryant, Sarah Martin, Sarah Ensor and Mari Boretti also had helpers. Cassidy Babin recorded the shutout in the Spalding goal with six saves. Bel Air goalkeeper Leah Lozzi was kept busy by the Spalding attack, but she did manage 16 saves. ARCHBISHOP SPALDING 6, BEL AIR 0: Julia Heck’s three goals and an assist, along with Madeline Ostrowski’s three goals, propelled a fierce, second-half outburst as the Cavaliers blanked the Bobcats. Kelly Patterson, Gracyn Bryant, Sarah Martin, Sarah Ensor and Maria Boretti had assists, while Cassidy Babin made six saves to earn the shutout. GOALS: AS - Ostrowski 3, Heck 3. ASSISTS: AS - Heck, Patterson, Bryant, Martin, Ensor, Boretti. SAVES: AS - Babin 6, Willard 0; BA - Lozzi 11. SHOTS: AS - 16; BA - 6. CORNERS: AS - 3; BA - 1. ARCHBISHOP SPALDING 2, THOMAS S. WOOTTON 1: Julia Heck notched a first-half goal, and Sammy Kirk scored off of a corner to propel the Cavaliers past the Patriots. Marissa Brown assisted on Heck’s goal, and Sarah Martin sent in the corner for Kirk. Cassidy Babbin made six saves. GOALS: WO - Ivanova; AS - Heck, Kirk. ASSISTS: WO - Vrovsky; AS - Brown, Martin. SAVES: WO - Harris 5; AS - Babbin 6. SHOTS: WO - 8; AS - 7. CORNERS: WO - 4; AS - 1. O’Connell senior midfielder Kara DeGuisto tried to stay patient but with each blast over the net and shot just off the mark outside the goal post in Wednesday’s girls’ soccer game against No. 2 Spalding, the task became a bit tougher. The fourth-ranked Knights spent a good portion of the opening 75 minutes on attack, consistently threatening as DeGuisto and senior forward Morgan Reuther created chance after chance with smart runs and creative passing. Spalding struck first on senior Laikyn Duffey’s 76th minute goal but DeGuisto finally broke through three minutes later, running onto a head ball from Reuther before finishing the breakaway. Playing on her Arlington private school’s new home turf field, DeGuisto salvaged a 1-1 tie for the Knights on an afternoon when the offense excelled at creating opportunities and struggled to finish. Playing a flat back four defensive alignment for the first time under Coach Bob Dieterle in his 11th season, Spalding — runner-up in the IAAM-A last season — hung tough with O’Connell (0-0-1) constantly around the net. The Cavaliers (0-0-1) earned the chance to grab an impressive road victory when it converted a late counterattack. Sophomore Sarah Ensor dribbled the ball down the left end line, drew out the goalie and sent a pass across the goal mouth. Hustling in from her wide midfield spot, Duffey arrived at the perfect time to rip a low shot into the open net. Spalding junior goalie Cassidy Babin (seven saves) stopped a pair of quick O’Connell opportunities after that, but the Knights’ persistence eventually paid off. In the 79th minute, senior goalie Ashley Cox (five saves) sent a long punt that found Reuther’s head. The Virginia recruit picked up an assist when DeGuisto sprinted into space and scored the equalizer about a minute before the referee whistled full-time. Following WCAC rules for regular season games, the teams did not play overtime. Afterward, O’Connell Coach Alberto Starace said his team will need to better capi­talize on its opportunities­ to achieve better results at this weekend’s McDonogh Invitational where the Knights are slated to play a pair of highly regarded teams, Mercy (Baltimore) and Pennington (N.J.). Shutting down one of the most prolific offenses in local girls soccer, second-seeded Archbishop Spalding pitched a 2-0 shutout against visiting John Carroll, Thursday afternoon, to secure a spot in the IAAM A Conference Championship Game. Spalding will meet top-ranked McDonogh, a 6-1 winner over Notre Dame Prep in Thursday's other semifinal, Sunday morning at 11:00 a.m. at Gerstell Academy for the 2011 A Conference crown. The teams were locked in a scoreless draw through one half, but the Cavaliers scored twice in the second half to pull off the win. A cross from Margaret Quinn on the left side, in the 43rd minute, found Laikyn Duffey on the right, who punched home the Cavaliers' first goal. In the 57th minute, Madeline Ostrowski on a feed from Gracyn Bryant sped in and slammed home the second goal. Spalding limited John Carroll to just three shots, while getting seven of its own. Cassidy Babin earned the shutout with three saves, while Gina Maiorana had three for John Carroll. Saves: JC--Maiorana 3; AS--Babin 3. Mo Ostrowski's goal in the 63rd minute lifted the Cavaliers. Third-ranked Archbishop Spalding and unranked Arundel played to a 0-0 tie in the first half of Saturday's contest. With tough defense from players like Kennedy Keer and Mo Meek and strong goalkeeping from Kara Grosbach (11 saves), the Wildcats (0-1) hung tough with the perennial powerhouse for sixty-three minutes. But constant pressure from the Cavaliers finally proved to be too much as juniors Mo Ostrowski and Gracyn Bryant collected second-half scores. Ostrowski made a move to her right and fired the ball just over Grosbach’s head into the next the back of the next. Five minutes later, Bryant scooped up a 50/50 ball and raced toward the goal. Saves: Arundel—Grosbach 11; Spalding—Babin 2, Bielski 0. A two-time Baltimore Sun All-Metro Player of the Year, Nairn helped Archbishop Spalding supplant perennial powers McDonogh (Owings Mills, Md.) and St. Mary's (Annapolis, Md.) as the dominant girls' soccer program in Maryland. Nairn scored 27 goals her senior season, led her team to a top five finish in the FAB 50 Top 5 and ended her career as the school's all-time leader in goals (70), assists (37) and points (177). She also played on the U-20 National Team while in high school. After graduation she was youngest member of U-23 National Team that won the World Cup and was elevated to the U. S. Women's National Team where she scored her 1st goal a game winner against Canada. She just completed her freshmen year at Penn State where she was nominated for the Herman Award. With three quick moves, Maggie Morrison condensed Archbishop Spalding's championship season into a six-second showcase and an appropriate end to a soccer career. "Anything can happen in this game," said Morrison, the Capital-Gazette Communications' Girls' Soccer Player of the Year. She proved it during the 42nd minute of the Interscholastic Athletic Association of Maryland A Conference final against Mercy. Morrison, a junior, took a deep pass on the left from Annie Hogan, stopped the ball, turned and dribbled through Sara Dorrance's legs. She sped by Kelly Syphard just below the 18 and - before colliding with Lexi Neidoba on the right -launched a laser shot into the corner for the game-winner. It opened the way for Mo Ostrowski's second-half score and guided Spalding to its third championship in four years. "Maggie is a terrific striker with great speed, skill and determination - combined with a touch of magic," Cavaliers coach Bob Dieterle said. Morrison, who's played on varsity for the last three seasons, joined forces up front with Courtney Hoyes and provided the scoring touch the Cavaliers (20-0-1) lost over the last two year. Playing behind Christine Nairn and Erica Paige, the only two above her on the Cavaliers' all-time scoring list, Morrison learned a few things and displayed her quick footwork and ability to consistently attack the defense. She led the team with 18 goals and 10 assists and matched Hoyes with six game-winners - making that brutal schedule a little bit easier and another title run possible. "She's one of the most competitive people I know, and she just goes at every game with the best mentality," Cavaliers defender Olivia Tomoff said. "She gives her all every time she steps onto the field, so that helps everyone else get pumped up for the game." Morrison is third on the Cavaliers' career list in goals (35), fourth in points (86) and sixth with 16 assists. She scored the second goal in a 2-0 victory over McDonogh during last year's title game by blowing past the goalkeeper well in front of the box for an easy strike. It was just a glimpse of the future. "I don't expect to score every game," said Morrison, who scored twice against St. Mary's and assisted Hoyes in a 2-1, double-overtime victory over John Carroll to reach the finals. "I am going to work my hardest, and I am going to try. I don't have any set moves." Mercy had no answer for Morrison's improvisations. Four defenders ran to redirect her scoring route, and four of them failed. "Spalding's a great team," Magic coach Albert Oni said. "They scored a great goal, one of the best goals of the season, at the right time." It wasn't anything new for Morrison, who played a part on three of the Cavaliers' four overtime winners. She assisted on Hoyes' strike against South River and, three days later, scored her second goal to dash Eastern Tech's late comeback in a 3-2 win. Following Hoyes' heroic header to match John Carroll at 1 with six seconds left in the semifinal, Morrison set up her right-side partner in the 97th minute to clinch a spot in the final. "Me and Maggie talk to each other all the time," Hoyes said. "We're just great together." Only a scoreless tie with Good Counsel, the Washington Catholic Athletic Conference champion, scarred Archbishop Spalding's run to the No. 4 national ranking at the season's close. Morrison scored two goals against Severna Park, Eastern Tech, St. Mary's, Bel Air, John Carroll, Glenelg, Seton Keough and St. Vincent Pallotti. She scored once during a 5-0 victory over the Institute of Notre Dame on Oct. 19, and her game-winner on Mercy was the finishing touch. "Playing three years with (Hoyes) and playing with Christine and Erica has definitely taken my game to the next level," Morrison said. "Hopefully, it'll continue to keep going." She still has one more season to extend her fast-growing legacy. "Maggie's a great player," said Hoyes, who capitalized on Morrison's continuous double- and triple-teams by pouring in 16 goals on 51 shots. "She's amazing. She's amazing in basketball, too." Of course she is. Because that's her main sport. Morrison, a quick and flashy point guard, is already gaining Division I interest for her athleticism, ball-handling and distribution skills. She averaged 10 points, 4.5 assists, 4.1 rebounds and 3.1 steals last season, while leading the Cavaliers (19-8) into the semifinals. "None of us knows how good she could really be," Dieterle said. "She plays basketball nine months a year. It's frightening to think she can possibly be better." Twenty-seven players converged into one pile in front of the goal, with smiles stretched across faces, arms raised in triumph and high-pitched screams echoing deep into the Finksburg air. Joshua McKerow - The Capital Annie Hogan, right, and her Spalding teammates rose to the occasion to record 20 wins this season. This wasn't just a celebration for Archbishop Spalding. It was a release. The Cavaliers completed a three-month stretch of defending the targets on their backs by blending consistent work and overpowering skill to translate into a near-perfect season and a second consecutive Interscholastic Athletic Association of Maryland A Conference soccer championship. "We earned it," Cavaliers coach Bob Dieterle said. Archbishop Spalding (20-0-1), which recorded the program's first 20-win season with a 2-0 victory over Mercy in Sunday's final, found itself ranked fourth in the nation by the National Soccer Coaches Association of America. Whether on defense or offense, the Cavaliers almost always came out one - if not more - step ahead of the opposition and were a 0-0 tie with Good Counsel away from being, presumably, the top team in the country. "I feel like we all are amazing, and we all know how to play together," said Courtney Hoyes, who scored four of her 16 goals during the first two postseason games. "There's going to be times where some of us make mistakes, but as a team, we play well." Spalding routinely silenced those staring back, while pulling away in a fluid motion. Eighteen Cavaliers scored - the last was two-game veteran Mo Ostrowski late in the final - to form a balanced attack that outscored the opposition, 77-6. Maggie Morrison, the author of a title-clinching bender past Mercy's Rachel Bourne, collected team-highs with 18 goals and 10 assists, and she paired with Hoyes to dismantle the opposing defenses - especially during the postseason. The two scored twice against St. Mary's in the opener, and Hoyes saved the Cavaliers with a goal six seconds away from elimination against John Carroll and again in the second overtime. "Every game, me and Courtney come in and say, 'Come on. Let's go. Let's play. Whatever happens, happens,'" said Morrison, who fed Hoyes on the game-winner in the 97th minute. "We're very supportive, so whoever can put one in puts one it, and we're all happy." Morrison and Hoyes - who each delivered six game-winners - turned out to be a winning combination for a team that, for the first time in five years, lacked an offensive player who struck instant fear in a defense. "We don't have a Christine Nairn or an Erica Paige anymore," said Olivia Tomoff, one of four returning players who formed a near-impenetrable defensive unit. "Courtney and Maggie really stepped up and got us goals; same with our outside midfielders and center midfielders. … We were a lot more team-oriented because we didn't have that one person to look up to to give us the win." They still got the wins, though, largely because of that back unit. Jocelyn McCoy, who's doing her best to usurp Karen Blocker's place as the program's best goalkeeper, recorded 16 shutouts. It hasn't been easy, but it certainly could have been more challenging. Thanks to the other 10 players on the field, McCoy didn't even field a shot from Mercy. With Tomoff, Kirsten Frank, Dani Beard and Michelle Boivin patrolling the back, McCoy stopped 69 of the 73 shots on goal and let one through - on average - once every 397 minutes, 29 seconds. "I'm sure Jocelyn would say we make her job easier, but it's definitely the goalie, too," Frank said. "Jocelyn, especially this year, really stepped it up." With that schedule, the entire team needed to elevate its game. Archbishop Spalding, with top billing during a two-week stretch in September, played and beat McDonogh (13-2) - ranked as high as seventh in the nation - Notre Dame Prep (11-3-1), Mercy (12-5-3) and John Carroll (12-6-2) twice just in its own conference. Add in games against Washington Catholic Athletic Conference champion Good Counsel (14-2-5) and public schools Severna Park (13-3), 15-1 prior to forfeiting two games, South River (14-2) and perennial contenders Glenelg and Eastern Tech - with seven state titles and 11 finals appearances since 1997 between them - and it's easy to comprehend that emotional release. "It's tough to win from beginning to end because everyone's coming to get you," said Dieterle, who calls this team the best he's coached in eight seasons. "You're going to get everyone's best game. Over the season, it's hard to keep everyone at that level." Even so, Archbishop Spalding was able to maintain. The Cavaliers were pressed into overtime on four occasions, and each time, they walked off the field coated in victory. Had Hoyes' late shot against Good Counsel not hit the left post, a No. 1 ranking would be an afterthought. "This team has been so good this year," said McCoy, owner of 30 shutouts in two years as a starter. "We have so many good players. … When we play, we're all pumped up and focused, and that helps us win." What began with a preseason retreat to Deep Creek Lake ended in a championship-sized celebration at Gerstell Academy - exactly how it was scripted. "We're all just really comfortable with each other from practice and Deep Creek and years of playing with each other," Frank said. "When you're comfortable with someone, you just have more confidence and everyone meshes better." The following are the nation's top reported performances for the 2009-2010 school year. This list will be updated periodically throughout the season. 14, St. Clairsville (Ohio) vs. Magnolia (W.Va.), Oct. 13, 2009 [14-5 final]. 29, Madi Oyer, Leo (Ind.). Hoyes didn't score a goal in the Cavaliers' second consecutive Interscholastic Athletic Association A Conference title match, but it wasn't necessary. She'd already done enough. Hoyes scored four goals in Archbishop Spalding's previous two playoff games - two against St. Mary's and both in a 2-1, overtime win against John Carroll in the semifinals. Hoyes, second on the Cavaliers with 16 goals, scored the tying goal against the Patriots with six seconds left in regulation before putting through a second with 3:03 left in overtime to give her team a shot at the title. Archbishop Spalding (Severn, Md.) claims its third title in four years and the future looks even brighter. FINKSBURG, Md.  On a cool Sunday afternoon near Baltimore, the girls' soccer team from Archbishop Spalding (Severn, Md.) made the transition from perennial power to soccer dynasty. 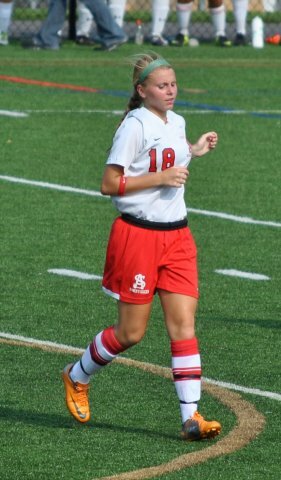 Maggie Morrison scored a team-best 18 goals with 10 assists as Spalding put together a 20-0-1 season. The Cavaliers captured their third Interscholastic Athletic Association of Maryland title in four years with this Sunday's 2-0 victory over Mercy (Baltimore, Md. ), and the future looks even more promising. Spalding's victory capped a 20-0-1 season and proved this program could make the change from its star-driven past to a more team-based approach. Five underclassmen started Sunday's final, with two scoring the goals and a keeper recording her 16th shutout of the season. Next fall, Spalding's varsity squad will add a group of players from this season's 15-0 junior varsity squad. Spalding's previous IAAM titles were delivered thanks largely to the likes of national team player Christine Nairn and current Division I players Erica Page and Karen Blocker. This year's title run, though, was based on stellar defense coupled with timely scoring. "Those past years we had a Christine Nairn, Karen Blocker, Erica Page, and this year we didn't have anybody that was known like those three where," Spalding junior Maggie Morrison said. "I think this year we played more as a team. We were depending on everybody instead of that one person, which I think is going to carry throughout the years." Interestingly, Spalding's top two offensive performers this season -- Morrison (18 goals, 10 assists) and senior Courtney Hoyes (16 goals, six assists) -- are standouts in other sports. Morrison is being courted by Division I basketball programs and Hoyes committed to Florida for lacrosse. Spalding is making a habit of winning IAAM titles -- three in the past four years. Considering the school's varsity and junior varsity combined for a 35-0-1 year, the future looks promising. Morrison put Spalding on the scoreboard early in the second half against Mercy after receiving a pass from Annie Hogan on the left wing. Morrison nutmegged the defender, regained possession of the ball and struck a right-footed low line drive that found the right netting in the 42nd minute. Mo Ostrowski, part of Spalding's talented freshman class, sealed the match by scoring her first varsity goal in the 72nd minute. The shutout seemed fitting considering Spalding allowed a mere six goals all year while playing in Maryland's strongest conference. Mercy never really threatened as junior keeper Jocelyn McCoy collected her 16th shutout. Any time Mercy came close to mounting an attack, Ohio-bound senior sweeper Kirsten Frank and James Madison-bound senior defender Olivia Tomoff were there to clean it up. This year's senior class wraps up its career with a four-year run of 76-3-7. Maggie Morrison didn't have a set plan. She was just tired of failing. Morrison overcame first-half struggles in front of Mercy's airtight defense and blasted a game-winning goal early in the second to pace Archbishop Spalding to a 2-0 victory and a third Interscholastic Athletic Association of Maryland A Conference crown in four years. "I just kind of take the ball and go," Morrison said. "If it goes in, great. If it doesn't, I'm going to work 10 times harder to put it in the net." She proved it in the 42nd minute. After the Magic's defense survived a consistent barrage of first-half penetration, Morrison took a pass from Annie Hogan on the left side and dribbled to the corner of the 18. Morrison cut through two defenders and drove a 20-yard shot past goalkeeper Rachel Bourne into the far side to break a scoreless tie and give the Cavaliers (20-0-1) their first 20-win season in program history. "When she did that, we knew we were going to win," Archbishop Spalding coach Bob Dieterle said. Mo Ostrowski added insurance with her first varsity goal with 8:10 left, and the Cavaliers' midfield and defense held Mercy (12-5-3) quiet. Mercy took just a second-half shot, and Jocelyn McCoy didn't make a save in her 16th shutout. "We try and make her look good, so she doesn't have to do much work," said Cavaliers defender Olivia Tomoff, whose 30-yard shot in the 31st minute hit the crossbar. Morrison's goal ended Mercy's improbable run through the postseason. Ranked seventh, the Magic knocked off No. 2 McDonogh, 1-0, and No. 3 Notre Dame Prep in penalty kicks to clinch a finals berth. Mercy fought off five corner kicks and eight shots during the opening half, but Morrison capitalized on the Cavaliers' first take in the second. "We weren't coming here to play for a tie or anything like that," Magic coach Albert Oni said. "We came here to win, and we truly believed we could win. … Spalding, at one point ranked the No. 1 team in the nation, scored a No. 1-type goal." Archbishop Spalding, which allowed six goals in 21 games, didn't let Mercy seriously threaten. The Magic put together a short run inside with 29 minutes left, but Dani Beard quelled it with two stops in a five-second span. Jordan Stenger played a deep pass inside to Alexis Prior-Brown, and Beard deflected her potential feed to the goal box. The ball kicked back to Alex Pryor, and Beard blocked her 12-yard shot. "The game's not over until the last whistle, and we just kept playing like it was 0-0," said Courtney Hoyes, who scored four goals in the Cavaliers' postseason, including both in a double-overtime, semifinal victory against John Carroll. Hoyes nearly added a fifth with 19:15 to play. Morrison cut through the left side of the 18 and directed a pass back to Hoyes in the middle. Hoyes' shot deflected off Mercy's Emily Borkowski and rolled to the net, and Samantha DeRoose came off the goal line for the clear. "I saw Rachel Bourne go off to the side, and I covered for her," DeRoose said. "I saw the ball and cleared it out as soon as possible." Ostrowski got it back 11 minutes later when she booted a left-footed cross into the net's upper-right corner to make it 2-0. A freshman, Ostrowski was the junior-varsity team's leading scorer and earned a promotion when the playoffs began. "It just happened," said Ostrowski, who entered when Teresa Doyle left with an injury in the 45th minute. "I was there at the right moment." The Cavaliers, who won titles in 2006 and 2008, could have had more if not for Mercy's defense. They failed to convert on three corners in the first 8:40. Bourne blocked Hoyes' close shot with 31:50 left in the half, and she made a diving save on Tomoff's 25-yarder on the left post three minutes later. "Our girls tried the best they could," Oni said. "It just wasn't enough to pull the win out." Hoyes took a low feed on the left from Morrison in the 14th minute and faked past two defenders near the end line. She turned back toward the goal, but sailed her shot wide. Morrison laid a spin move on the Magic in the 26th, only to drive a shot over the crossbar. Morrison made up for it, though. "Usually, the games that are close, we come off (the field) and step it up a notch and take it to the next level," Morrison said. "We definitely did that coming out in the second half. We had the momentum, and we took it." GOALS: AS - Morrison, Ostrowski. ASSISTS: AS - Hogan. SAVES: ME - Bourne 4; AS - McCoy 0. SHOTS: ME - 1; AS - 11. CORNERS: ME - 0; AS - 7. Owning territory and creating countless scoring chances, the top-ranked Archbishop Spalding girls soccer team did everything it wanted in the first half of Sunday's Interscholastic Athletic Association of Maryland A Conference championship game against Mercy except score. Closing halftime words were simple from the Spalding coaches: "Get excited in there and hit it!" Junior forward Maggie Morrison was listening. Two minutes into the second half, Morrison collected a ball from Annie Hogan on the left side and went to work. She cut hard inside to get by a defender, gaining time and space, and then unleashed a shot from 18 yards that found the upper far corner. Her 18th goal of the season was perhaps the prettiest and most important, as it led the Cavaliers to a 2-0 win over the No. 7 Magic that gave the program a successful defense of the IAAM A Conference title, its third in four years. "It was great," said Morrison. "Annie Hogan played me a great ball wide and I got lucky and beat their last defender - I just looked up and it was just me and the goalie. I looked for a spot, hit it and thank God it went there." The win completes a 20-0-1 season for Spalding, which went 12-0 against conference opponents and allowed just six goals all season. "It's tough to run from beginning to end because everybody is coming after you," said Spalding coach Bob Dieterle, who added that this was the program's first 20-win season. The Cavaliers came out fast and had Mercy (12-5-3) locked into its end most of the first half. But despite five corner kicks and many shots - high, wide or turned away by Mercy goalie Rachel Bourne - they were unable to break through. Freshman Mo Ostrowski, in her third varsity game, scored the late insurance goal to seal the championship. For Mercy, which overcame illness and injury and upset No. 2 McDonogh in its playoff opener, the loss doesn't tarnish a fine season. "We weren't coming here to hopefully play for a tie or anything like that," Mercy coach Albert Oni said. "We came here and truly believed we could win. Spalding, who at one point was ranked the No. 1 team in the nation, scored a No. 1-type goal. That first goal was amazing, so hats off to the goal scorer and hats off to their program for a great game.I thought it was an amazing season and one I'll never forget." Coming off of its toughest game of the season, a 2-1 double overtime victory over John Carroll in the IAAM A Conference semifinals, the undefeated Archbishop Spalding soccer team avoided the drama and turned in a dominating performance on Saturday against Mercy in the league championship game at Gerstell Academy. The Cavaliers controlled possession of the ball for nearly the entire game, keeping it deep inside of the Magic’s territory, and they blanked Mercy, 2-0, to win their second straight Conference title. The Magic (10-5-3), the tournament’s seventh seed, upset both No. 2 McDonogh and No. 3 Notre Dame Prep to earn the right to play for the title. But Mercy was overmatched against the Cavs. In the first half, Spalding (20-0-1) put six shots on goal and came close to scoring a couple of times. Senior Olivia Tomoff had a direct free kick hit off the post and junior Maggie Morrison fired a shot hard towards the goal from about 25 yards out that just missed top shelf and went over the net. Mercy’s defense, led by Sarah Lindler and All-Conference performers Jordan Stenger and Sam DeRoose, played tough and shutout the Cavaliers in the first half. After the break, the Cavaliers, ranked No. 5 in the Nation by ESPN Rise, kept the pressure on the Magic defense and it paid dividends just two minutes into the second half. Morrison received a pass from sophomore midfielder Annie Hogan in the left corner, put the ball between the legs of a defender, ran to the middle of the field and fired it into the right corner of the net to give Spalding a 1-0 lead in the 42nd minute. Morrison’s team leading 18th goal of the year put the Cavaliers at ease and deflated the stout Magic defense. Despite giving up the early second half goal, the Magic continued to play tough. Goalie Rachel Bourne made an outstanding save against Morrison with 10 minutes left to play to keep Mercy’s deficit to one goal. But two minutes later, Spalding freshman Mo Ostrowski, playing in just her third varsity contest after being called up from the junior varsity squad, scored a goal to clinch the Cavaliers third title in four years. Mercy showed why it advanced to the championship game by displaying a lot of heart. The Magic came in prepared to take its best shot. Saves: M-Bourne 4; AS-McCoy 0. It was business as usual for the Spalding girls' soccer team Sunday afternoon in the IAAM A Division final, as the Cavaliers cruised to their fourth consecutive conference title with a 2-0 win over Mercy. The victory, though, meant more than just another championship. It gave No. 1 Spalding its first 20-win season. That's no small feat for a program that is traditionally one of the best in the country, let alone this area. The Cavaliers finished with a 20-0-1 record, their lone blemish coming in a 0-0 tie to No. 2 Good Counsel back on Sep. 30. "Some of the teams in the past were more focused on an individual star player, and even though a couple players did the majority of the scoring this year, this team was much more," said Coach Bob Dieterle. "Our kids were so on top of their game today, just like they have been for most of the season." No kidding. The IAAM tournament was a perfect cap to Spalding's dominant campaign. Throughout the season, the Cavaliers have had to deal with teams taking a conservative approach, essentially trying to score 0-0 ties. In the semifinals against John Carroll last Thursday, for instance, Spalding allowed just three shots on goal, but found itself down 1-0 with less than a minute remaining. John Carroll's goal came on a penalty shot awarded in the game's opening minutes. Spalding hit three posts and had several other near misses while controlling play the rest of the way. But just in the nick of time, forward Courtney Hoyes scored with about six seconds remaining in regulation. Then, Hoyes delivered the game winner in double overtime on a nice feed from junior Maggie Morrison to advance to the finals. Morrison and Hoyes provided many of the highlights for Spalding this season. Hoyes, a senior, finished with 16 goals. Morrison had 18 goals and 10 assists. But the most impressive statistics belong to junior goalie Jocelyn McCoy, who benifitted from playing in back of talented defenders Kirsten Frank and Olivia Pomoff. McCoy allowed just four goals all season (0.23/game) and posted 16 shutouts. Even more impressive is the competition Spalding accomplished it against. Currently ranked No. 4 in the nation by ESPN, the Cavaliers defeated Severna Park (No. 4 in the Post rankings), South River (No. 9 in the Post rankings), Glenelg (2008 Maryland 1A state champions) and Baltimore powerhouse McDonogh (currently No. 8 in the country according to ESPN). The Cavaliers currently have an area-best 36-match unbeaten streak dating back to Sep. 22, 2008, when they lost a 3-2 decision against Good Counsel. Dieterle, though, has a bone to pick with his friend and Good Counsel Coach Jim Bruno. The only thing separating the Cavaliers from a perfect season in 2009 is that tie against the Falcons, who won the WCAC championship on Sunday, earlier this season. After playing to a scoreless draw after regulation, Good Counsel officials decided forgo overtime, a decision Dieterle found puzzling. "I'm thinking about calling up Good Counsel and asking to play the last 20 minutes that we should have," Dieterle joked. "I've asked around everywhere and we've never found anybody else who doesn't play overtime." The Archbishop Spalding girls soccer team found themselves in unfamiliar territory for 76 minutes yesterday. For the first time in 19 games, the Cavaliers were losing. John Carroll held a one-goal lead for the majority of regulation until Courtney Hoyes came to the rescue. The senior didn't want her season to end, so she knocked in a header with six seconds left in regulation and pushed through another goal with 3:03 left in overtime to send Archbishop Spalding into the Interscholastic Athletic Association of Maryland A Conference final with a 2-1 victory. On the tying goal, Hoyes took a pass served in from the left side by Teresa Boyle and beat John Carroll keeper Gina Maiorana inside the far post. Hoyes took a through pass from the right side from Maggie Morrison in overtime and put her foot on it before depositing it by a sprawled-out Maiorana as bedlam erupted on the Cavaliers' sideline. "We kept the momentum up and didn't let it go," said Hoyes, who tallied her 15th and 16th goals. "I knew Maggie could do it. Me and her work incredibly together. I was just there a put it in." The top-seeded Cavaliers will face No. 7 Mercy at 3:30 p.m. Sunday at Gerstell Academy for the conference championship. After a foul was called on the edge of the 18-yard box in the third minute, Mel Lookingland booted a penalty kick past Jocelyn McCoy to give John Carroll (11-6-2) a 1-0 lead. Once the Cavaliers got behind, they dialed up the pressure, outshooting the Patriots,15-3, in regulation while hitting two crossbars. John Carroll seemed content with just trying to clear their zone, while keeping three or four players glued to Morrison, who has accumulated 17 goals this season. "They were triple-teaming Maggie all day," Cavaliers coach Bob Dieterle. "We knew that was coming, and what we were trying to do was mix it up. That was one of the reasons we were able to get that ball across to Courtney - because they had so many people flooded over to Maggie's side." With the Cavaliers' intense offensive pressure and the attention paid to Morrison and Hoyes, chances were plentiful. Morrison managed to clank the crossbar in the eighth minute, while Vickie Connor did the same midway through the second half. "We had a lot of good opportunities, but it was one of those that, frankly, I was concerned that it was going to be one of those days," Dieterle said. "Our team played really well. They had minimal amount of shots, but nothing dangerous." The Cavaliers need just one more victory to net 20 and bring back a title for the second consecutive season and third time in four years. GOALS: JC - Lookingland; AS - Hoyes 2. ASSISTS: AS - Boyle, Morrison. SAVES: JC - Maiorana 8; AS - McCoy 3. SHOTS: JC - 5; AS - 18. CORNERS: JC - 2; AS - 6. Scoring a dramatic goal to help her team is a rare and special feat for a soccer player. Archbishop Spalding forward Courtney Hoyes had twice the thrill. With the No. 1 Cavaliers on the verge of elimination against a determined John Carroll team in Thursday's Interscholastic Athletic Association of Maryland A Conference semifinals, Hoyes provided new life with a game-tying goal with six seconds left in regulation. Then, in the closing minutes of the second overtime period, Hoyes finished off a cross sent in by junior Maggie Morrison to give the defending league champs a 2-1 win that sends them back to the title game. The Cavaliers (19-0-1) will take on No. 7 Mercy in Sunday's final set for 3 p.m. at Gerstell Academy in Finksburg. "We just kept the momentum up and we didn't let it go. I knew Maggie could do it. Me and her work incredible and I was just there to put it in," said Hoyes, who now has 16 goals and six assists this season. "I'm really excited [about Sunday's title game], and I know that we're going to play with all we have and hopefully win another title." The No. 10 Patriots (12-6-2) took a 1-0 lead in the fourth minute when Mel Lookingland finished on a penalty kick and then defended strong. The Cavaliers pressed for the equalizer throughout regulation - hitting the crossbar twice and seeing other chances go wide or sent away by goalie Gina Maiorana - and they were finally able to break through in the final minute. Midfielder Teresa Doyle won a ball on the left side and sent an ideal cross to the far post, headed home by Hoyes. Both teams had chances in overtime before Morrison sent a ball across from the right wing that Hoyes got to in front for the game-winning goal. McCoy recorded two more shutouts this week, bringing her season total to 14. Last week, Spalding shut out Institute of Notre Dame (5-0) and Mount de Sales (3-0). The team also had a 7-1 win over St. Vincent Pallotti. MCoy's 14 shutouts are a main reason for Spalding's 17-0-1 start and FAB 50 Top 5 ranking. Among her shutouts is a 1-0 win over current FAB 50 Top 10 team McDonogh (Owings Mills, Md.). On the season, McCoy has allowed only three goals in 18 matches with a .955 save percentage. There are two big reasons why Archbishop Spalding girls soccer is a nationally ranked contender: Maggie Morrison and Courtney Hoyes. Morrison and Hoyes combined for three goals and an assist as the host Cavaliers defeated St. Marys, 4-0, in the Interscholastic Athletic Association of Maryland A Conference quarterfinals yesterday. "(Morrison and Hoyes) have been really special for us this season," Cavaliers coach Bob Dieterle said. "They work together really well." Hoyes, who scored off of a header and made an assist, has 14. "We all work really well with each other," Hoyes said. Morrison, who scored twice, has a team-high 17 goals. "We are pretty inseparable, even outside of school and soccer," Morrison said. The Cavaliers' chemistry was on display against the Saints as Archbishop Spalding (18-0-1) controlled possession and the game from the outset. The Cavaliers' midfield and defense allowed just three shots on goalkeeper Jocelyn McCoy, who notched her 15th shutout. Morrison's first goal came less than eight minutes into the game. She found a lane on the left side of the goal and crossed with her left foot into the back right corner of the net. Despite being outmatched, the Saints' defense performed well for most of the first half. Only five of Archbishop Spalding's 15 shots came in the first half. Goalkeeper Lizzie Roeble made several leaping and diving saves to keep her team in the game, and her twin, Allie Roeble, was effective at keeping the pressure low. However, the Cavaliers struck again with just four minutes left before the break as Vickie Connor kicked a perfect feed to Hoyes in front of the net for a header. "I just hit it," Hoyes said. "I didn't know where it was going, honestly." Things only got worse for the Saints after intermission. Stephanie Smith added to the lead less than three minutes into the second half, scoring on an assist from Hoyes. For the next few minutes, the Saints (4-13) finally started to reach the Cavaliers' back line. It was too late. Morrison closed the scoring when she intercepted a pass in front of the Saints' goal, pulled the ball back to avoid a defender and pounded the ball into the top right corner of the net. "We knew we had to play our best game to beat them," Saints coach Meredith Beard said. "They're a great team." The Cavaliers advance to the IAAM A Conference semifinals at home tomorrow at 3:45 p.m. They'll face No. 4 John Carroll. "You've got to continue to build," Dieterle said. "I think the girls are getting more and more excited." GOALS: AS Morrison 2, Hoyes, Smith. ASSISTS: AS Hoyes, Connor, VanOrder. SAVES: SM - Roeble 10; AS - McCoy 3. SHOTS: SM - 3; AS - 15. CORNERS: SM - 1; AS - 7. The junior goalkeeper led the No. 1 Cavaliers to three wins last week, recording two shutouts and allowing just one goal in 240 minutes of play. A two-year starter, McCoy has helped the Cavaliers to a 17-0-1 record this season. She has 14 shutouts and has surrendered just two goals in going 10-0 in the Interscholastic Athletic Association of Maryland A Conference. McCoy has 63 saves with a .955 save percentage. Sarah Backoff, Courtney Hoyes and Annie Hogan tallied goals in Archbishop Spalding's 3-0 victory over Mount de Sales yesterday. The Cavaliers will attempt to go through their conference schedule undefeated for only the second time in program history tonight against Pallotti. The Cavaliers (16-0-1) finished unbeaten in 2005. Maggie Morrison, Olivia Tomoff and Emily Brybon assisted on the Archbishop Spalding's goals. Top-ranked and undefeated Archbishop Spalding outshot visiting Mount de Sales, 21-0, on Tuesday as the Cavaliers defeated the Sailors, 3-0, in IAAM A Conference soccer. With the win, Spalding (16-0-1, 9-0-0) clinched the top seed for the league playoffs. The Cavaliers still have to play St. Vincent Pallotti, tomorrow at home, but even if they lose, they own the tie-break over McDonogh, which could possibly match Spalding if it were to fall to 9-1. Sarah Backof put Spalding on top with a first quarter goal, which was assisted by Maggie Morrison, and Spalding took a 1-0 lead to the half. Courtney Hoyes and Annie Hogan each scored in the second half, while Olivia Tomoff and Emily Brydon supplied assists. Mount de Sales completed its regular season at 7-6-2 overall and 2-6-2 in the conference. The Sailors currently reside in ninth place in the conference, pending the outcome of a few other games. Aiming to complete an undefeated regular season, Archbishop Spalding won for the 15th time this fall, as it defeated the Institute of Notre Dame, 5-0, on Monday in Severn. The Cavaliers (15-0-1, 8-0-0) powered out to a 3-0 first half lead and kept the Indians off the scoreboard all afternoon. Courtney Hoyes scored twice for Spalding, while Maggie Morrison, Teresa Doyle and Lindsay Van Order all scored once each. Morrison added a pair of assists, while Doyle and Vicki Connor had one each. Jocelyn McCoy and Bridget Bielski split time in the Cavalier goal, combining for seven saves. For IND (7-7-0, 5-4-0), Courtney Bembeneck had seven saves as well. Goals: AS-Hoyes 2, Morrison, Doyle, Van Order. Assists: AS-Morrison 2, Doyle, Connor. Saves: IND-Bembeneck 7; AS-McCoy 3, Bielski 4. Archbishop Spalding junior forward Maggie Morrison scored two goals and added an assist as the No. 1 Cavaliers got off to a fast start at Glenelg, coming away with a 3-1 win Monday. Senior forward Courtney Hoyes opened the scoring in the game's 12th minute when she finished off a chance from Morrison, who scored her first goal in the 18th minute and later gave the visitors a 3-0 lead in the second half. Morrison now has 10 goals this season with Hoyes adding nine as the other catalyst for the Cavaliers, who improved their record to 13-0-1. Junior goalie Jocelyn McCoy had three saves to record the win. Taking on all comers, as usual, the top-ranked Archbishop Spalding soccer team stepped outside the IAAM A Conference, Monday, and traveled to Howard County to challenge No. 5 Glenelg. The trip proved productive, as the Cavaliers downed the Gladiators, 3-1. 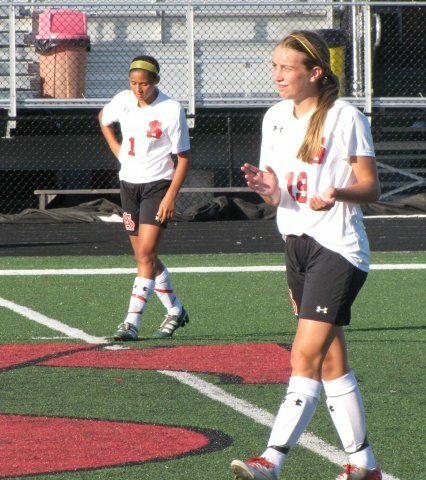 Maggie Morrison powered the offense with two goals and an assist, as undefeated Spalding improved to 13-0-1 overall. Courtney Hoyes scored the third goal, in the evenly contested match, while Stephanie Smith and Sarah Backof added assists. The teams each took 11 shots and both had three corner opportunities. Glenelg's goal was scored by Beverly Kirshe, in the second half. Spalding opened with two first half goals to establish control of the contest. BEL AIR - Continuing its quest for an undefeated season, top-ranked Archbishop Spalding continued its winning ways by beating John Carroll, 2-0, in girls soccer yesterday. Maggie Morrison's 12-yard blast broke the scoreless tie in the 19th minute. Morrison added another goal in the second half, off a laser shot into the top right corner. The two goals were all the Cavaliers (12-0-1) needed. "Our defense kept winning the balls and getting them to me in good position," Morrison said. "I knew if I kept working hard and plugging away, I was going to get a goal or two." Courtney Hoyes, the Cavaliers' other striker, hit the crossbar 10 minutes into the second half and created many chances. Hoyes and Morrison discussed creating havoc for the Patriots' defense. "Courtney and I have been playing together for four years, and we know where each other is on the field at all times," Morrison said. "She has been scoring a lot recently and was a big part of the offense today." The Cavaliers did not have an easy time beating the Patriots (7-3-2), and coach Bob Dieterle expected nothing less. "John Carroll has had a tremendous program for a long time," he said. "We knew it would be a tough test to come to their field and come out with a win. They gave us a great game, and we had to play well to win." The Cavaliers' defense limited the Patriots to very few quality offensive chances. It was the fast, experienced Cavaliers backline that had Dieterle raving. "Our defense won the game for us today, and I told them that," Dieterle said. "John Carroll strung a few passes together in the midfield, but our defense stepped up anytime they got close to the box." "They are experienced, talented and fast in the back, and we are inexperienced up top," he said. "Their defense made it difficult for us to get great chances." With an undefeated season and championship dreams still intact, the biggest obstacle remaining for the Cavaliers might be themselves. "Obviously, we weren't going to overlook John Carroll," Dieterle said. "But remaining focused solely on our opponent is sometimes a challenge. Our girls always remain loose, they don't panic and have confidence in their games. In the end, they believe their game won't let them down." GOALS: AS - Morrison 2. ASSISTS: AS - Hogan, Braynt. SAVES: AS - McCoy 8; JC - Maiorana 7. SHOTS: AS - 13; JC - 7. CORNERS: AS - 2; JC - 4. With a confident "been there, done that" approach, the No. 1 Archbishop Spalding girls soccer team walks onto the field for every game firmly believing it will come out with a victory. Wednesday's game against No. 8 John Carroll was another prime example, as the visiting Cavaliers made good on their opportunities on offense and played their typical seal-tight defense to come away with a 2-0 win over the Patriots. The defending Interscholastic Athletic Association of Maryland A Conference champions improved to 12-0-1 overall and 6-0 in league play, getting two goals from junior forward Maggie Morrison and their 11th shutout of the season. John Carroll, which played well in spurts but struggled in its offensive third, fell to 7-3-2 this season. Morrison made a strong run with the ball down the right side, working her way into the penalty area before placing a shot from 14 yards to the far post for a 1-0 lead in the 20th minute. The Cavaliers' defense proved disruptive, limiting the Patriots to three shots on goal, all of which were easily handled by junior goalie Jocelyn McCoy. Morrison put the game away with under three minutes to play. She said the Cavaliers' success in past big games is a key in their remaining a dominant team. "It comes a lot with our team unity - I've never played on a closer team in my entire life," said Morrison, who has eight goals and four assists this season. "We're comfortable with each other, we joke around together and I think that shows on the field, too." The Patriots were often to the ball first and put passes together through the midfield, but had difficulty creating scoring chances. "You've got to give credit to a team that keeps winning," John Carroll coach Gary Lynch said. "They just keep winning - no matter what it looks like - they put the ball in the net and the other team doesn't put the ball in the net. I think that comes with experience. "We can play two-thirds of the field with anybody, but the top third of the field we're struggling a bit, so we're working hard on that." Goals: S-Morrison 2. Assists: S-Bryant. Saves: S-McCoy 3; JC-Maiorana 6. Half: S, 1-0. After opening the season with 10 consecutive wins, top- ranked Archbishop Spalding battled Good Counsel to 0-0 draw earlier this week, in girls soccer. Friday in Brooklandville, the Cavaliers put that behind them as they powered their way to a 4-0 IAAM A Conference win over host Maryvale Prep. Courtney Hoyes paced Spalding with two goals, as it outshot the Lions 13-7. Junior Dani Beard and sophomore Emily Brydon scored the other two goals. Spalding is now 11-0-1 and atop the A Conference with a 5-0 record. Maryvale fell to 4-4 overall and 1-4 in the league. Goals: AS-Hoyes 2, Beard, Brydon. Saves: AS-McCoy 6, Bielski 1; MP-Smith 9. A regulation soccer goal post is all of five inches wide, but as Courtney Hoyes, the leading scorer for No. 1 Archbishop Spalding, watched her shot glide toward the goalmouth in the Cavaliers' nonconference showdown with No. 3 Good Counsel on Wednesday night, it might as well been a mile. The shot, which came with just over four minutes remaining in the game, careened off that dreaded piece of aluminum and rolled harmlessly out of bounds, cementing a 0-0 tie between two of the area's premier girls' soccer programs. "Any kind of break, that ball is in," Spalding Coach Bob Dieterle said after his team registered its first non-win of the season. "It's just by the grace of God we didn't score." Ranked as the top girls' soccer team in the country by some publications, the Cavaliers have had a relatively small margin of error in compiling a 10-0 record. Spalding has won three overtime games and been a part of several other close calls already this year, with less talented opponents packing it in the defensive end. "Every team just wants to tie us," explained Hoyes. Good Counsel would disagree. The Falcons controlled large portions of Wednesday night's game, with the duo of Crystal Koczot and Alexis Prada the main catalysts in the midfield. But they generated few legitimate scoring chances through the game's first 65 minutes, and Spalding took advantage in the latter stages. Its late-arriving aggression created perhaps the contest's most exciting moment. With 17 minutes remaining, the Cavaliers' Michelle Boivin executed a nifty move around a Good Counsel defender to get inside the penalty box before centering right to the feet of teammate Emily Brydon in front of the net. Standing a mere three feet away was Good Counsel goalkeeper Alecia Dennis, who up until that point had seen just one shot all game. Dennis guessed correctly on Brydon's point-blank shot and stopped the potential game-winner. "I was scared there," Good Counsel Coach Jim Bruno said after his team's defensive breakdown led to the chance. "Goalies are at the mercy of the other players . . . and sometimes the post, too." Notes: Spalding goalkeeper Jocelyn McCoy has given up a goal just once in her past 25 appearances dating back to last season. The junior has allowed just 14 goals in 42 career games. . . . The result was Good Counsel's third tie in a row, but the Falcons have not given up a legitimate goal during that time. In its two prior games, the only goals the team allowed came on penalty kicks. When it comes to girls' soccer, Archbishop Spalding (Severn, Md.) simply has McDonogh's (Owings Mills, Md.) number. Perhaps not in terms of possession or shots, but where it matters most -- the scoreboard. Spalding ran its record to 7-1-1 in the last nine meetings with McDonogh following a 1-0 victory in a battle of FAB 50 Top 10 programs Friday. The match was one of two weekend contests that featured Top 10 girls' teams going head-to-head. In the other, Downingtown West (Downingtown, Pa.) used a Lauren Wilson goal in the closing seconds to edge Conestoga (Berwyn, Pa.), 2-1. That combination of results, plus a loss by last week's FAB 50 No. 1 Jesuit (Portland, Ore.), allows Downingtown West to move into the No. 1 spot this week followed by Spalding at No. 2. "They outshot us. They did a better job controlling the midfield. Our defense bent, but did not break," said Spalding coach Bob Dieterle following the victory. "In the second half, we got a break." That break came in the form of a goal by sophomore midfielder Francesca Springer on a play set up by Olivia Tomoff with four minutes left in regulation. Spalding is 10-0-0 and faces a pair of quality opponents the next two weeks in former FAB 50-ranked Good Counsel (Olney, Md.) and undefeated John Carroll (Bel Air, Md.). McDonogh slips to 6-1-0. The teams are expected to finish first-second in the Interscholastic Athletic Association of Maryland (IAAM) A Conference race and could meet again in the postseason. Friday's showcase girls soccer game -- No. 1 Archbishop Spalding at No. 2 McDonogh -- lived up to its potential and more. It had everything: creative play on offense, tight marking on defense and some fine play from the goalies. 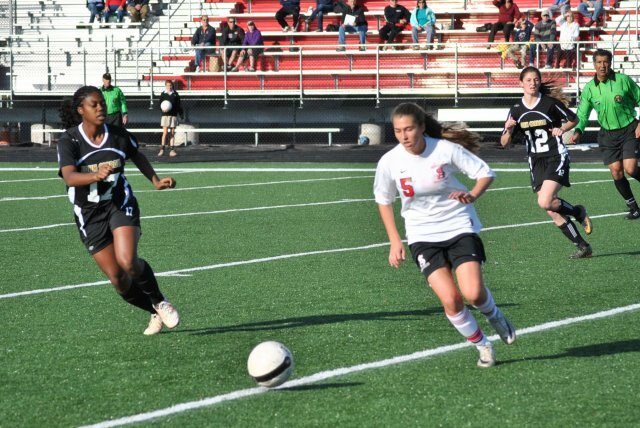 The visiting Cavaliers, defending Interscholastic Athletic Association A Conference champs, came away with a 1-0 win when midfielder Francesca Springer neatly placed a shot to the far post from a tough angle with five minutes to play. It was a rematch of last year's title game -- a 2-0 Spalding win. While John Carroll, Mercy and some other quality IAAM foes would like to have a say, it would be no surprise to see the same two teams in this year's title game. Just how big was Friday's game? A Direct TV blimp was hovering above for a few minutes in the first half. Archbishop Spalding senior sweeper Kirsten Frank left the field at McDonogh on Friday more tired than usual. It turned out to be worthwhile exhaustion for the All-Metro standout. After Frank and the Cavaliers' defense continually shut down the Eagles' persistent attack, the visitors got an offensive spark from an unlikely source. Midfielder Francesca Springer scored with five minutes left to give No. 1 Spalding a 1-0 win over No. 2 McDonogh in a rematch of last year's Interscholastic Athletic Association of Maryland A Conference championship game. "I think the key was we just communicated really well the whole game," Frank said. "Even when things got crazy and they were pushing a lot of people up, we all knew who we were marking, we all knew what our job was and basically it came down to the communication." The hard work on defense - junior goalie Jocelyn McCoy made eight saves to record her eighth shutout - paid dividends for the Cavaliers when Springer stayed with a ball down the left side before lofting a left-footed shot from 8 yards on a tough angle for her second goal of the season. "They gave us a really big challenge, and I tried to just get in and take a shot. It barely got there, and I thought it was out, but it went in," Springer said. The defending champion Cavaliers (10-0 overall, 4-0 league) had the best chance to score in the first half after McDonogh senior goalie Megan Lerner was issued a yellow card to set up a free kick just outside the penalty area with 12 minutes to play before the half. Olivia Tomoff cleanly struck the free kick that sophomore backup goalie Morgan Ruhl tipped off the crossbar. Ruhl made a second save in front off the rebound before Lerner returned to the game. McDonogh dominated midfield and controlled play for the majority of the second half but wasn't able to finish off any scoring chances before or after Springer's goal. "I thought overall this was the type of performance we were looking for from our team. It's just a matter of spreading them out a little better and finishing opportunities," McDonogh first-year coach Harry Canellakis said. Goals: AS-Springer. Assists: Hoyes. Saves: AS-McCoy 8; M-Lerner 2, Ruhl 2. Half: 0-0. With its biggest match looming, it would have been easy to understand if the top-ranked Archbishop Spalding girls soccer team had more of an eye to the future than on yesterday's opponent, Notre Dame Prep. That wasn't the case, however, as the Cavaliers struck in the first four minutes and never stopped applying pressure en route to a 5-0 victory over the Blazers. Archbishop Spalding (9-0) is 3-0 in the Interscholastic Athletic Association of Maryland A Conference heading into tomorrow's championship rematch with McDonogh. "We had a really good practice (Tuesday), and we came out of feeling we were really ready for this game," said coach Bob Dieterle, whose Cavaliers earned a 2-0 win over McDonogh in last year's final. "We were talking about not looking ahead. NDP's a quality team. They came out the same way that we practiced. We jumped out to a pretty good lead with a lot of pressure." Stephanie Smith knocked in her third goal of the season with four minutes elapsed, beating two defenders to reach the penalty area before flipping a left-footed shot over the head of Blazers goalkeeper Shelby Perkins for a 1-0 lead. About 10 minutes later, Teresa Doyle pushed Archbishop Spalding's advantage to 2-0, slipping a groundball shot into the goal after dribbling around her defender. Then, with less five minutes left in the first half, Ariel Dominguez knocked in the first of her three goals following a beautiful cross by Smith. Dominguez outworked a defender for the ball and then kicked it in while Perkins tried to recover from missing the cross. "I'm really pumped for that game (against McDonogh)," Smith said. "Basically, it's the game of the year. (But) we take our games one at a time. Like our coach says: 'Don't worry about McDonogh now. Get past NDP and then right after this game, put it all toward McDonogh, and we'll come out with a win.' "
Archbishop Spalding had some near-misses throughout most of the second half before Dominguez dropped in a pair of goals on passes from Jackie Kane in the final five minutes. "It was good practice, and it's giving us confidence and for sure our subs are getting confident, too, and we're all getting ready for the game (with McDonogh)," Dominguez said. "Playing the ball out wide is really good for us. We really spread the ball out." The Cavaliers were equally impressive on defense, allowing just a pair of long-range shots by Notre Dame Prep, which struggled to keep possession of the ball in its offensive end. Nearly every time the Blazers crossed midfield, Archbishop Spalding's defensive core of Olivia Tomoff, Kirsten Frank, Dani Beard and Gracyn Bryant simply took the ball away or intercepted a pass and moved the ball back the other way. Spalding is ranked No. 3 in the ESPN national poll, while McDonogh checked in at No. 5. GOALS: AS - Dominguez 3, Smith, Doyle. ASSISTS: AS - Kane 2, VanOrder, Backof, Smith. SHOTS: NDP - 2. AS - 20. SAVES: NDP - Perkins 3, Scheel 4. AS - McCoy 2, Bielski. CORNER KICKS: NDP - 0. AS - 6. The No. 1 Archbishop Spalding girls soccer team, the defending Interscholastic Athletic Association of Maryland A Conference champions, has already had its share of tight games in its 6-0 start. Both No. 5 South River and Eastern Tech took the Cavaliers to overtime, their opener against No. 8 Severna Park was scoreless at the half before a 3-0 win, and in their league opener at No. 7 Mercy on Wednesday, the champs earned a 2-1 win. Spalding coach Bob Dieterle said this early season has been reminiscent of last year when the Cavs won a number of overtime games. "It's a good thing and that's what I tell the kids," Dieterle said. "It builds character and mental toughness, and helps you prepare for the bigger games later in the season." In this week's ESPN RISE Top 50 poll, Spalding moved from No. 5 to No. 3, while IAAM foe McDonogh cracked the top ten at No. 8. The Eagles, who were ranked No. 14 last week, made the jump after knocking off then-No. 3 Pennington Prep (NJ), 2-0, at the McDonogh Tournament on Saturday. Hoyes contributed mightily to the Cavaliers' 2-0 week, recorded five points, picking up a pair of assists against Eastern Tech Tuesday and scoring a hat trick against St. Mary's Friday. Hoyes assisted both Maggie Morrison's scores Tuesday. This one was for Gabby Espinosa. Inspired by the sight of her injured teammate taken from the field, Maggie Morrison made up for a squandered lead and gave Archbishop Spalding's girls soccer team its second overtime victory in as many games by clipping Eastern Tech, 3-2, last night. Morrison stood alongside Courtney Hoyes on the sideline, while Espinosa lay on her back for 27 minutes after a collision with Eastern Tech's Paige Yeager. Both players hit the ground with 2 minutes, 14 second left in regulation. While Yeager limped off the field, Espinosa left on a stretcher about 25 minutes later and was taken by ambulance to an area hospital. "She took a hard one," said Morrison, who gave the Cavaliers (3-0) a 2-0 lead in the 48th minute before ending the game off a corner kick 2:24 into in overtime. "The crack and her screaming gave me the chills." Espinosa is believed to have suffered a broken tibia, Archbishop Spalding coach Bob Dieterle said. A half-hour after the Cavaliers gave away a two-goal lead in a 79-second span over the 75th and 76th minutes, Espinosa's teammates gathered in a circle prior to overtime and chanted, "One, two, three, Gabby." Teresa Doyle played a pass off a corner kick into the goal box on the Cavaliers' first clear chance in overtime. Hoyes delivered a short header to Morrison, who drove a shot into the left side of the net. After his team coasted to a 2-0 lead through the first 75 minutes, Dieterle pulled most of his starters, and the Mavericks (0-1) took advantage. Kelsey Ports sent a 40-yard free kick over backup goalkeeper Bridget Bielski's left shoulder to close the gap with 4:23 left, and Allison Williams transformed a turnover above the Cavaliers' 18-yard box into a goal to make it 2-2. "It was a perfect set-up," Williams said. "I just hit it off my knees, and I hit it and hoped, and it went in." Ports' goal ended Archbishop Spalding's scoreless streak at 11 games. "We were just hoping to get one and get a little respect," Eastern Tech coach Kim Williams said. "Then they get two, and it was amazing. It just shows what we have, and this is Game 1." Jocelyn McCoy, who set a school record during a 1-0 victory over South River Saturday with her 11th consecutive shutout, came back into the game following Williams' score. Eastern Tech took only three shots on McCoy during her 75 minutes on the field, while Bielski faced two in eight. "It wasn't good coaching," Dieterle said. "Too many (substitutions) at one time." Morrison, who scored the final two goals in the opener against Severna Park, provided an encore performance for the Mavericks. Morrison left the field 53 seconds into the game, after landing on a defender's leg and hearing her knee crack, and didn't return in the first half. Already holding a 1-0 lead because of Stephanie Smith's score in the 12th minute, the Cavaliers got Morrison back in the second half. She didn't wait long to announce her presence. Hoyes tracked down a loose ball deep in the Mavericks' zone, beating defender Meghan Bengert, and fed Morrison by the goal box. Morrison met the ball in stride and delivered a crossing shot to the left for a 2-0 lead. Hoyes and Morrison hooked up once more in overtime - with help from Doyle's right foot - to finish what they started. "Teresa had a beautiful cross, and Courtney stepped right in front of the goalie like we practiced, and I just got a nice head on it," Morrison said. "I was just there to finish. Thank God." And they did it for Espinosa. "It was painful," said Cavaliers defender Kirsten Frank, who sat with Espinosa the entire time she was down on the field. "I can't stand seeing people cry. I started to tear up because I hate watching people cry. But everybody's been there before. It hurts really bad now, but in a couple days, when she knows what's wrong, they're going to fix her and give her some pain medicine, and everything's going to be good." GOALS: ET - Ports; Williams; AS - Morrison 2; Smith. ASSISTS: AS - Hoyes 2; Brydon, Doyle. SAVES: ET - Willem 3; AS - McCoy 2; Bielski 0. SHOTS: ET - 5; AS - 13. CORNER KICKS: ET - 0; AS - 6. The senior sweeper, a four-year starter and first-team All-Metro selection, was the defensive catalyst in leading the No. 1 Cavaliers to two shutout wins in last weekend's Pioneer Shootout at Anne Arundel Community College. The defending Interscholastic Athletic Association of Maryland A Conference champions opened their season with a 3-0 win over No. 8 Severna Park on Friday and then defeated No. 6 South River, 1-0, in overtime Saturday. Frank disrupted both teams' offenses with tenacity, smarts and poise. Frank is set to play at Ohio University next year. Jocelyn McCoy, Jr. Spalding Soccer - McCoy collected seven saves over a two game span last week to pass Karen Blocker for the Cavaliers' all-time record for consecutive shutouts with 11, McCoy, who led Archbishop Spalding to a 3-0 win against Severna Park Rriday and a 1-0 mark over South River Saturday, collected her 15th and 16th shutouts of her 22 game career last weekend. After playing sparringly as a freshman, McCoy replaced Blocker last year and led the Cavaliers to a 19-1-3 record and their second Interscholastic Athletic Association of Maryland A Conference title in three years. One mistake was all Courtney Hoyes needed to make a little history. Hoyes ended nearly 84 minutes of scoreless soccer when she beat a pair of defenders and drilled a game-winner last night to give Archbishop Spalding a 1-0 victory over South River and help Jocelyn McCoy record her 11th consecutive shutout. "I love her," said McCoy, who passed Karen Blocker for the Cavaliers' all-time mark for consecutive shutouts. "I'm so happy." Maggie Morrison crossed a lead pass for Hoyes above the right corner of the goal box, and South River goalkeeper Lyndse Hokanson and defender LaRia Rodgers chased it down. As the two collided, Hoyes was able to recover the ball and send it into the middle of the goal with 6 minutes, 7 seconds remaining. Hokanson made five saves, but she needed one more. "I knew you can't take her on," Hoyes said. "When she fell, I just got up and did it." Hoyes was able to do what Morrison couldn't. A day after scoring twice during a 3-0 victory over Severna Park, Morrison couldn't find a way past Hokanson and the Seahawks' defense. Morrison shot wide nine minutes into the second half, and Hokanson made sliding saves in the 52nd, 65th and 70th minutes. "My defense played out of their minds," Hokanson said. "They made my job a whole lot easier. All I had to do was return the favor by making a couple saves." Perhaps Hokanson's biggest save came in the first half. Fifteen minutes into the game, Teresa Doyle took a hard, close shot off a corner kick, and Hokanson leaped through the air to make a save on the right to keep the game scoreless. "That one was going in," Cavaliers coach Bob Dieterle said. "Those are the two best keepers in the county." McCoy came out ahead, though. For the 11th consecutive time, she held the opposition scoreless, passing a record Blocker set two years ago. Blocker, who's playing at Liberty, collected 57 shutouts over four seasons with the Cavaliers - 17 as a senior. McCoy, who made three saves, got plenty of help from her defense. In addition to keeping South River's attack out of the zone for much of the game, Stephanie Smith and Jackie Kane headed out shots on the left post early in the second half. "If they weren't there on the post," McCoy said, "they could have had two goals." Morrison and Smith nearly hooked up for a game-winner on the first play of overtime. As Hokanson came out of the box, Smith's shot went high. When Hokanson left the box two possessions later, though, Archbishop Spalding (2-0) took advantage. "If things maybe had gone our way, things might have been different," Seahawks coach John Sis said. "They have some feisty players up top and obviously created the play that won the game." GOALS: AS - Hoyes. ASSISTS: AS - Morrison. SAVES: SR - Hokanson 5; AS - McCoy 3. SHOTS: SR - 5; AS - 9; CORNERS: SR - 2; AS - 3. Archbishop Spalding received a strong challenge from South River, Saturday night, at Anne Arundel Community College, but the Cavaliers were able to escape with a 1-0 victory when Courtney Hoyes scored early in overtime. Hoyes followed-up her own shot and regained the ball following a scramble in front of the goal, before send the ball into net for the win. Spalding pressured the Seahawks throughout, but South River goalkeeper Lyndse Hokanson frustrated the Cavaliers until overtime, as she stopped five shots. Jocelyn McCoy made three saves for Spalding, as she was credited with her 11th consecutive shutout, a new team record. Saves: SR-Hokanson 5; AS-McCoy 3. Playing Severna Park in a season-opening tournament, Friday at Anne Arundel Community College, top-ranked Archbishop Spalding, which is also ranked in the Top 10 nationally, broke a scoreless tie with Severna Park, by netting three second half goals and claiming a 3-0 win. Maggie Morrison scores two of the goals, while Annie Hogan added the third. The Cavaliers kept constant pressure on the Falcons, out-shooting them 12-5. Goalkeeper Jocelyn McCoy need just four saves to record her 10th straight shutout. The Archbishop Spalding girls soccer team got a quick lesson on what to expect as the No. 1-ranked team in the area: Opponents will be coming with their best. In Friday's season opener against No. 8 Severna Park, the Cavaliers were often outworked by the Falcons in a scoreless first half, but the defending Interscholastic Athletic Association of Maryland A Conference champions wasted no time making amends. Sophomore midfielder Annie Hogan scored in the first minute of the second half and junior forward Maggie Morrison added two goals as the Cavaliers answered the call with a 3-0 win at Anne Arundel Community College's Pioneer Shootout. Hogan took a short pass from Stephanie Smith on the right side and neatly found the lower near post from 14 yards. Morrison provided the rest of the offense, scoring in the 54th minute and again in the 60th on a strong run and finish from 10 yards. Senior sweeper Kirsten Frank was dominant in back, with junior goalie Jocelyn McCoy turning back three shots for the shutout. "At halftime, we just said, 'Let's pick it up, let's pick it up,' and it was a good team effort," said Morrison. "We know we have targets on our backs, and that's why we're working ... even harder than last year, because we want to take care of the No. 1 spot." The Falcons stayed even with the Cavaliers in the first half and often got to the ball first, but they weren't able to get any quality scoring chances. The halftime message for the Cavaliers was to work harder, have better spacing between the midfield and forwards, and get the ball out wide before attacking the goal. The Falcons got a strong performance from sophomore midfielder Gabriele Moreno, with goalie Alexandra Cavey finishing with nine saves. Spalding will take on No. 6 South River - a 6-0 winner over St. Mary's - today to highlight the tournament's second day, with the game set for 7:30 p.m.
FREDERICK, MD – The York College women’s soccer team spoiled the Hood College Blazers’ 2009 home opener on a brilliant Thursday afternoon in Frederick, MD as the Spartans captured a 2-1 Capital Athletic Conference victory. The Blazers, who were christening their new Field-Turf facility, fall to 1-1 overall and 0-1 in the conference while the Spartans are now 2-0 and 1-0 in the league. The Blazers waited just 3:25 into the game to put the first goal in the history of the new facility on the board. The Spartans were pushing forward into the Blazer defensive half before a turnover allowed the hosts to counter, leading to Cara Jordan feeding a long outlet pass to Jessica Devine who got behind the Spartan defense and beat Spartan goalie Sarah Spanarkel (Toms River, N.J./Toms River North) in a 1-v-1 situation for the goal. The goal was the first-ever for the Blazers against the Spartans. York had won their previous five meetings with Hood by a combined score of 24-0. The Spartans resumed the pressure on the Blazer defense and tied the game just over ten minutes later as junior Ali Jones (Riva, Md./Archbishop Spalding) collected a loose ball off a corner kick from Steph Mergler (Street, Md./North Harford) and drove the ball into the back of the net in the game’s 15th minute. The Spartans and Blazers played the remainder of the half without a score as the teams took the 1-1 tie to the break. The Spartans outshot the hosts 9-3 in the first half while they also held an 8-2 bulge in corner kicks. The second half began with Hood’s Carlie Colella getting a behind the Spartan defense and firing a shot on Spanarkel just 37 seconds into the half. The Spartans’ sophomore netminder challenged the shot and made the stellar save to preserve the tie for York. The Spartans took the lead with Jones struck again in the 60th minute as Mergler hit her with a long outlet. Jones collected the ball, dribbled to the top of the box and chipped a ball past a charging Rachelle Buhrman for the game-winner. The Spartans continued to pressure Buhrman for the remainder of the game. York had at least three other great chances in the second half but either Buhrman made a stop or the Spartans just barely missed the cage with the shot. The Spartans finished the game outshooting the Blazers 23-4 including 14-3 in shots on goal. York also fashioned a 13-4 margin in corner kicks. Spanarkel recorded a pair of saves as she improves to 2-0 overall while Buhrman recorded 12 saves in the loss. Jones now has three goals for the Spartans in 2009. The Spartans return to action on Saturday afternoon when they host Susquehanna University in a non-conference contest at Graham Field. The match is slated for a 1:00 pm kick off. Kirsten Frank is entering her fourth year as one of the nation's fiercest defenders in one of the country's best girls' soccer teams. And the Ohio University-bound senior says that "once that Archbishop Spalding uniform goes on, it's like putting on your game face." "It's all business, and everything that we've worked on in the preseason, you want to make it all about to happen," said Frank, who, with fellow defender, Olivia Tomoff, has been part of a nearly invincible backfield for the Cavaliers. "Whether running in a game, or in scrimmages, we don't take it easy on each other. We go in hard for the 50-50s, just like we do in the games." So intense is the Cavaliers' defense -- even in practice -- that shutting out the junior varsity squad is considered a source of pride. "We almost had history a couple of days ago when the JV had a breakaway against the varsity and almost scored, but we had a freshman in the goal, and she stuffed the breakaway," said eighth-year coach Bob Dieterle, making sure to mention that neither Frank or Tomoff was in at the time. "If either of them were in the game, I don't think the ball would have gotten within 40 yards of the goal," Dieterle said. That tenacity is why the defending champion Cavaliers have at least reached the Interscholastic Athletic Association of Maryland's A Conference semifinals during each of the past four years -- a stretch during which they won the league tournament title in 2006 and last season, and were runners-up once. "We really work on pushing each other -- from the first person when we're running, to the last person in the drill, they've got to finish as fast as they can," Tomoff said. "We encourage each other, but at the same time, we push each other to the limit because the way that we practice carries over to the game." Over the course of much of the 2005, 2006 and 2007 seasons, the Cavaliers were 29-0-5 against IAAM competition, and, 49-0-5 in total games. "If we're going to have the best possible season, that tenacity has got to be there," said Dieterle, whose has compiled a record of 108-21-13 and sent numerous players to the collegiate soccer ranks. "That's the one thing that every girl that comes through this program knows -- is that we're going to play as hard as we can the whole 80 or longer," Dieterle said. "You're going to earn it every second of every game." But it's not as if the Cavaliers haven't also been blessed with skills and talent. One of the Cavaliers' most notable players is Christine Nairn, a 2008 graduate who is now in her sophomore year at Penn State. Last month, as the youngest member of the U.S. Women's National Soccer Team, Nairn scored the game-winning goal in a 1-0 victory over Canada in South Carolina -- this in the game's 89th minute after entering seven minutes earlier for only her second career national team appearance. Nairn also was a member U.S. Under-20 National Team World Cup Champs. "I know that college soccer at the Division I level is very competitive, and only a few players get acknowledged, and I'm going to into it trying my best," Frank said. "But my immediate goal for the team is to win as many games as we possibly can, and, to ultimately, win that championship game." Last year's Cavaliers did just that, ending a 19-1-3 season with a 2-0 shutout of McDonogh on Nov. 2 in the IAAM A Conference title game. The victory improved the Cavaliers' record against league foes to 11-0-2, and raised their unbeaten streak to 15 games. Overall, last year's Cavaliers out-scored their opponents by a combined, 60-12, with 14 shutouts. The Cavaliers, whose lone defeat was a 3-2 setback against Washington, D.C.-area power, Good council, enter this year with a mark of 13-0-2 in their past 15 games. Tomoff said that much of their chemistry is bolstered from their time as co-captains on their club team, the Freestate Phoenix. "We can say things to each other and know exactly what's going to happen, and that makes it really makes it easy to communicate. Hopefully, having us back there helps the other two defenders and Jocelyn to hold it down with us," Tomoff said. "When we're back there on defense, we work on basically not even let them into our own half of the field. We're there to pressure as hard as we possibly can. We don't want to get beat by a first or second touch," Tomoff said. "Kirsten and I pride ourselves on being able to go hard into the tackles, not letting up, finding feet and clearing the ball out to our forwards." The Cavaliers' 10-game winning streak includes nine straight shutouts, during which they out-scored their rivals by a combined, 28-0. Junior keeper, Jocelyn McCoy, was in the goal for those nine consecutive shutouts, which are one shy of the record (10) established by Karen Blocker, a sophomore at Liberty College. McCoy's 14 shutouts of a year ago tied the single-season record established by Blocker, who was in goal for a school record 57 career shutouts, and allowed only 37 career goals (a .457 goals-against average) in 81 games. Frank and Tomoff have been mainstays throughout the careers of the Cavaliers' goalies. "Kirsten has been the central defender or the sweeper for two of Karen's years and one of Jocelyn's," Dieterle said. "And Olivia was brought up at the end of her freshman year, so they've been together back there for two full seasons in a row." "You want to win it all, that's my main goal," Frank said. "You want to try, as a defender, to have as few goals scored on us as possible. You just never want to let up. If you can get them, you want all shutouts."